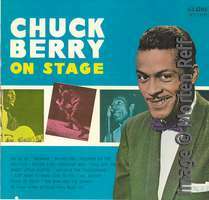 Since the late 1970s Chuck Berry traveled to shows domestic and overseas with his friend and bass player James "Jimmy" Marsala. Marsala acted as the band leader performing sound checks and instructing the keyboarder and drummer, often locals, on how to play when sharing the stage with Berry. 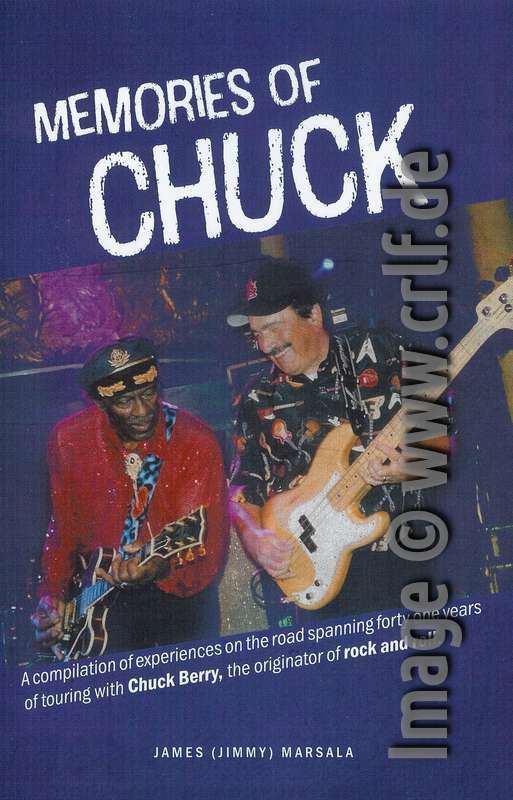 Now Marsala has written a book called "Memories of Chuck" in which he reports his experiences on the road. Marsala's recollections could probably have made this a highly interesting book. Unfortunately they didn't. Given the reports from promoters and journalists about Berry's habits regarding payments or female fans, one would expect nice stories from a first-hand witness. Unfortunately the result is tame and boring. Marsala tries to correct the public image of Berry by defending him in every way. For every incident reported, Marsala finds a probable and nice explanation, whether on leaving a promoter with paid rooms to get a different hotel, or sending the band off-stage, or overrunning fans with a rental car. All of Marsala's stories are so biased you are tempted to stop reading after one third of the book. Only in the very end you'll find a chapter on Berry's "thriftiness". Everyone else would probably call it "closefistedness". Seems as if Marsala in the end did not really liked to sleep on the floor only because Berry decided to book just a single and single-bed hotel room for the two. Besides two chapters containing short anecdotes of Marsala's life with Berry, the book chronologically describes incidents on various shows and tours between 1979 and 2014. There are five pages about Berry/Marsala's performance at Bill Clinton's inauguration party, five pages about a show in Spain, five pages about a tour in Brazil, and so on. Everything is very brief. Of the 180 pages of the book, only about 100 contain text at all. Most of the remaining pages contain color(!) photos from Marsala's collection. Most show Marsala and Berry on stages all over the world, or they show Marsala and the band waiting for transportation. Other photos show Berry or Marsala with other famous artist such as Ray Charles, Aretha Franklin or Bill Wyman. Unfortunately many of the photos are not of best quality. As Marsala writes from a first-hand witness position, we are supposed to believe what we read. You should take into account that Marsala writes from memory, though. And memory may not always be trusted. I cannot judge on most of the anecdotes reported, but I have been on-site at the 1983 Eindhoven concert. This is where the Berry photo from this site's logo originated. In 1983 I wrote about this concert and what I wrote does not necessarily match Marsala's memories. I wish Marsala would have taken the time to write more, to write more professionally and to write more openly. Then this could have been a very good book. As it is, you will still want to buy a copy, but like me you will be disappointed. Since none of the larger publishers seems to have been interested in selling this book, Marsala published it on his own using a Canadian company called FriesenPress. This is not a publisher but a company who offers self-publishing. Marsala provided the complete book, probably along with the non-professional layout. FriesenPress stores the book's electronic file and prints a copy as soon as a buyer wants one. They work together with sellers such as amazon and even with local book-on-demand companies for fats supply. When I ordered my copy from amazon Germany, the paperback I got was printed on demand by a German company. Yours may come from some place completely different. Some sellers are listed here. This is typically considered to be the original cover of CHESS LP-1480. As such for instance it was used for the Japanese mini-LP replica Universal Music Japan UICY-94630 we wrote about in October 2010. 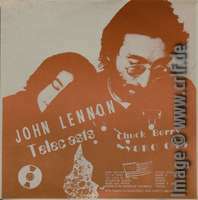 While this is the best known cover for this album and certainly is the variant sold most often, it is not necessarily the 'original' album cover — if you define 'original' as the first version of this cover. 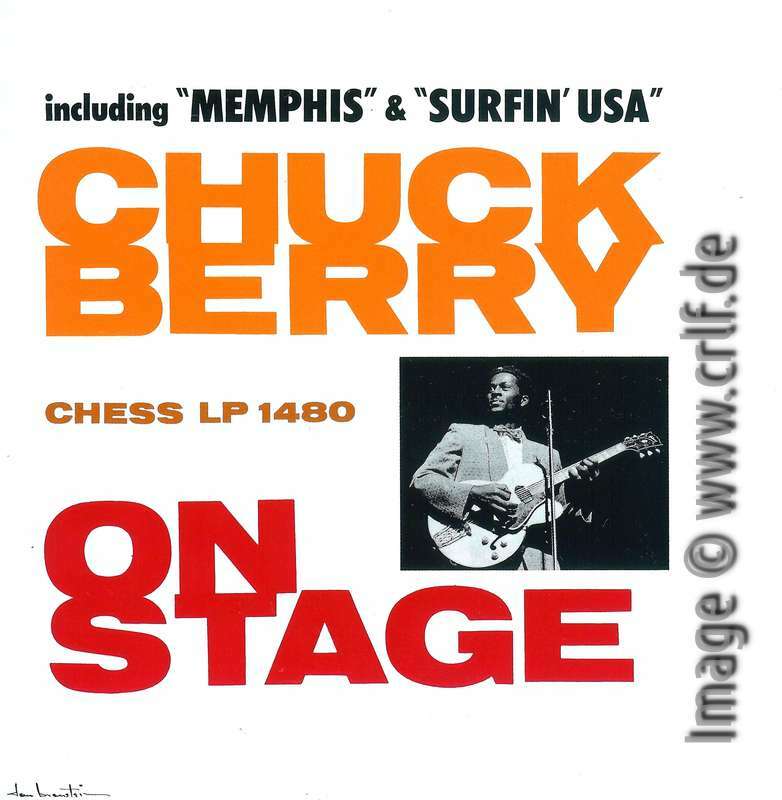 The interesting thing to look at is the line saying including "MEMPHIS" & "SURFIN' USA" above the artist name. 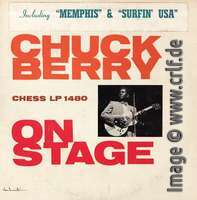 It is printed in black letters and refers to the then current famous cover versions of Memphis, Tennessee and Sweet Little Sixteen (as Surfin' USA). The original pressings of this LP had a sticker on the front cover saying 'Including "MEMPHIS" & "SURFIN' USA"'. Thus there was no printing, just a sticker containing the same wording as the printed text, though 'Including' is written with a capital I. The text on the sticker is in blue instead of black and it uses a different font. A contemporary ad from Chess showed a black and white image of the sticker version of the album. And the sticker seems to be applied hastily just before the photo shooting as crooked as it is. Given that the sticker is both on the advertisement and on the advance copies, we can state that the sticker version existed before the printed version. It must have been commercially available as well, since Morten's copy is not a promotional one. Do you have a copy of CHESS LP 1480 which has no sticker and no printing of the 'including' text? If you do, send us an image and we would be happy to show it here. Yes, the cover exists without the sticker. I have one and the record label is black with the golden CHESS on top. It has the same label, writing, and matrix as the DJ copy. "The copy I bought features the second label, the black label (repress) image on page 60." Thierry's two records make clear that the label with the golden logo is not from a later re-pressing such as Morten's book had suggested. Obviously this is the original label (left: non-sticker version, right: DJ copy), at least for the early copies. As this was the brand-new CHESS label containing the new multi-colored logo, it's safe to assume that CHESS wanted at least the DJs see this new logo and label. 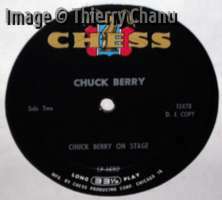 Thierry however makes clear that one has to be careful to distinguish CHESS records just by their label into 'original' and 'later' pressings. 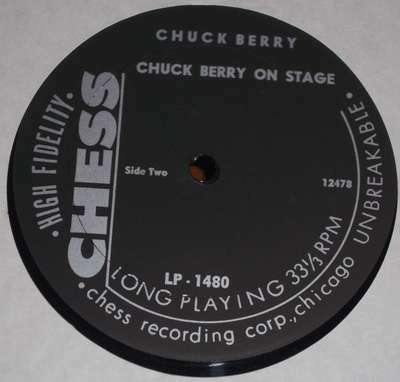 Chess used three or four pressing plants at the same time, so we can find an original record with different labels. 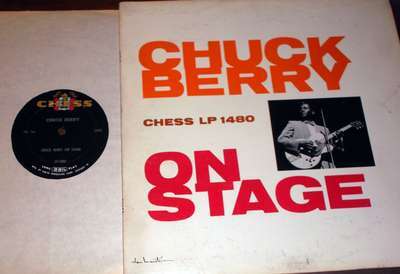 These are additional early labels of CHESS LP-1480. All came in the third variant of the cover, i.e. the one with the printed text. Even though these look like earlier CHESS labels, we probably shall regard them as used interchangeably at the same time. Here's one more regular copy with the black label and vertical Chess logo (different than the other black). This one though has been pressed using a different matrix. It was pressed by the Monarch pressing plant in July 1963. This can be told by the etching located in the run-off (dead wax) area of the record. The Monarch pressing plant is identified by an MR inside a circle, always in the trail-off area. The numbers following this symbol tell the date of mastering. 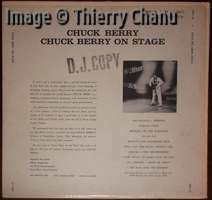 The 'original' cover of 'Chuck Berry On Stage' did not have any printed text except for artist, label, and album name. At least some of these first versions had been available commercially. Before advertisements for this album were created and before advance copies were sent out to DJs, CHESS added a sticker referring to the most important songs. This became the second cover version. The third and final version must have been printed shortly after or even together with public release. This version had the song titles printed. 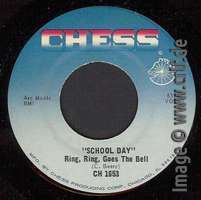 The earliest copies had the multi-colored label with the chess knight logo, probably to demonstrate the new logo to DJs. Concurrently older design labels containing the vertical CHESS logo were used. These exist in blue as well as in different black variants. At least two different matrices existed to produce the bulk of the 1963 pressings. Big Beat was a French fan magazine which started in the late 1960s and ended after 21 issues in the 1980s. Thirty-five years later the magazine was brought back to life with a 22nd issue. Since then it's purely digital with no paper releases. 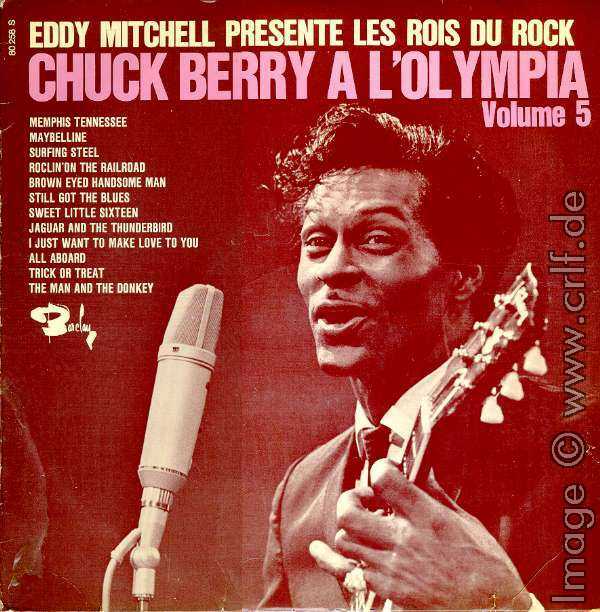 Issue 26 was recently published and is of huge interest to Chuck Berry collectors - even if you don't speak French. Big Beat Magazine is a non-commercial project by Alain Mallaret created with a team of volunteers having pure passion for Blues, Country Music and Rock and Roll, just like the creators of this site and so many others around the world! 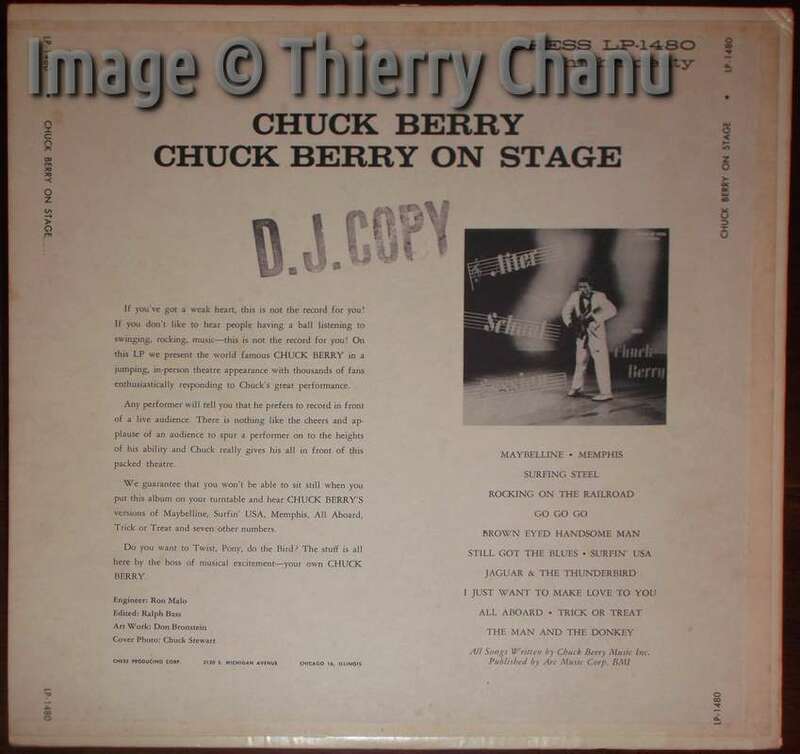 Issue #26 concentrates on Chuck Berry and includes both a very nice and interesting photo collection from Jean-Pierre Ravelli and a huge discography by Pierre Pennone. The contents of the discography follows more or less the contents of this site, which Pierre used and referred to. It is, however, limited to the official records released by Chess, Mercury and the likes as most of the 'official' discographies do. Pierre's discography fills almost 100 pages because he has managed to include hundreds of images showing labels, front and back covers, and sometimes even the booklets coming with the records. A minor thing to complain about is that Pierre did not always show the original records but used re-issues sometimes. All in all it's a great discography based on a huge amount of work. Well done, Pierre! Alain told me that there's also a PDF version of the magazine available. You cannot download it anywhere, but if you want one, Alain would send it to you. I won't publish Alain's email here, but if you contact me I'd be happy to forward your request. Alain also said that because this is a non-commercial project, you may freely give the PDF to other collectors interested. It's great to have fellow collectors working so enthusiastically. Many thanks to Alain and Pierre for their work and for telling me about it. Picture Sleeve for CHESS 1883 Nadine - counterfeit or real? 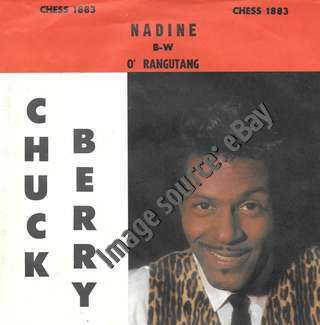 $251.11 - That's what a collector this week paid for a picture sleeve of CHESS 1883, the U.S. original single Nadine. And just for the sleeve only! Why did this collector pay that much? Because nobody I know has ever seen this sleeve before. There are similar looking picture sleeves for the CHESS singles following Nadine. But a PS for 1883 has been unknown. We wonder if this sleeve truly is a genuine product. Or whether it's one of the many counterfeit picture sleeves popping up lately. Since the image on eBay looks reasonable and since the seller seems to be trusted, it may in fact be a long-lost item. If you've been the buyer, let us know once you received it. What is your opinion? Collectors should know that some of the US 45 picture sleeves had the titles only on one side whereas the other side had the same image and layout but no song titles. I also have one of these sleeves which has no song titles on both sides. Which would make it easy to imprint whatever you want. 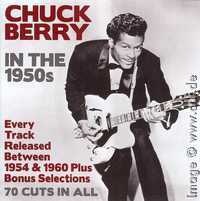 Berry Pickin' is a Chuck Berry instrumental recorded in December 1955. 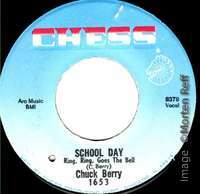 Chess released it as a filler on the B side of Berry's first album After School Session and afterwards it was mainly forgotten. 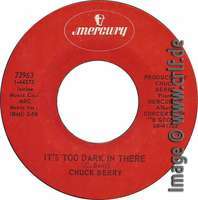 You won't find any discography which would list a 45rpm single containing Berry Pickin' ... except for our Chuck Berry Database! This is because there indeed was a single which contains this instrumental even though only by error. Morten Reff has half a sentence about it in his "Chuck Berry International Directory, Volume 1", but you had to read the text very carefully. Morten owns a copy of the Berry Pickin' single, I have one, and maybe you do as well. Here's its story. It's the story of the Chess single released in March 1957 with the catalog number 1653. One side of the record contains the song School Day, the other side contains the instrumental Deep Feeling. To understand the story, we have to understand first how record production works. You'll probably know, but just in case here's a summary: Record production is a four-step process which starts in the recording studio and ends in the record pressing plant. 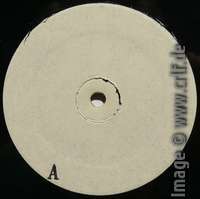 Here the record is literally pressed by putting a blob of plastic (polyvinyl chloride PVC or short Vinyl, once also shellac) into a pressing machine which flattens it to a disk and presses the grooves into the two surfaces. During this also the labels are firmly attached to the record. To press the grooves into the disk, you need to have a negative for each side which has the grooves elevated. This negative is called a "stamper" and made from metal to allow the pressing of thousands of records. To create a stamper you have to have a positive model of the record to produce, typically one for each side of the final disk. This positive looks like an ordinary record having the grooves engraved. It can be played on a standard turntable e.g. for testing purposes. It is not made from vinyl, though. Instead this positive typically consists of a metal kernel coated with a soft material (wax, nitrocellulose lacquer, or in the 1930s cellulose acetate). These master disks are called lacquers or acetates. A turntable-like machine cuts the grooves containing the sound into a blank lacquer which then is used in an electroplating process to create the metal stamper. The record cutter gets the sound from a master tape (at least in the era we're talking about here) which contains the final recording along with all overdubs and mixes. If you need a lot of records (such as Chess in the 1950s) it made sense to add another, intermediate step between lacquer and stamper which allows you to create many stampers for pressing in multiple presses and pressing plants. To do so, the lacquer is first transferred into a negative "father" record using electroplating. Then this "father" record is used to create multiple positive "mother" records, also known as "matrix" records (plural "matrices"). These matrices were checked and then sent out to the pressing-plants to create the stampers. Let's go back to Chess 1653. After recording and whatever overdubs and fades were needed, the production process began with a magnetic tape containing the master recording. For identification purposes, each master tape was given a unique number. In this case, the final recording of Deep Feeling got the number 8378 and the final recording of School Day got 8379. Our database lists those where known. Using a record cutter both master tapes were transferred to at least two different lacquers. We know that there has been more than one lacquer as Chess 1653 was pressed both at 7-inch size to be played at 45rpm and at 10-inch size to be played at 78rpm. You needed different matrices for each obviously. The lacquer for the 7-inch 45rpm singles was electroplated into multiple mother disks or matrices. Again we know that there must have been more than one matrix, as original silver-top issues of Chess 1653 have been made from slightly different matrices. You can tell by looking at the writing in the inner "dead wax" area of the single. On some copies you find the numbers 45-8378 x and 45-8379 x engraved. This additional engraving was either hand-written on the lacquer after the grooves have been cut or - more probably - added to the mother disk after checking. 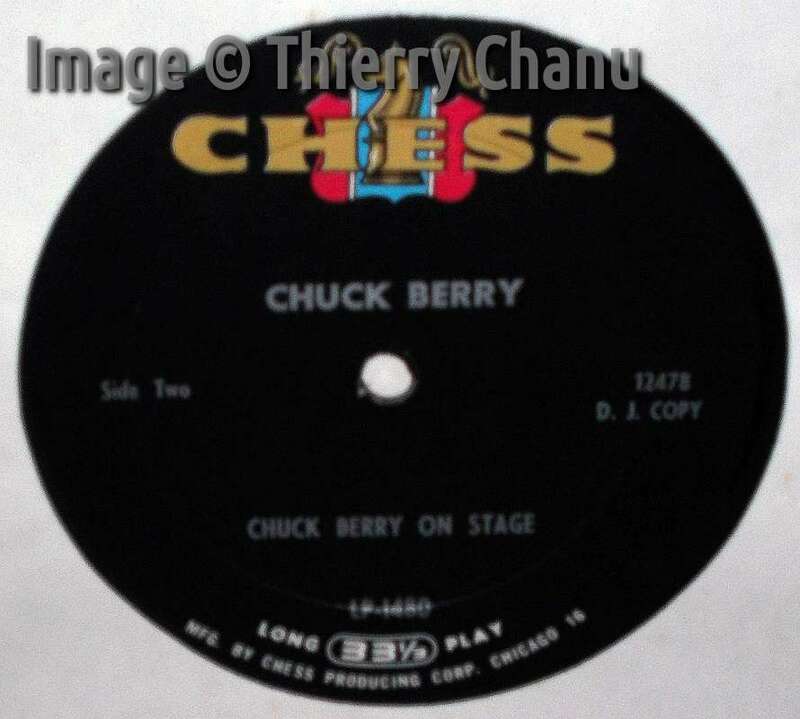 The mother disk going to the Plastic Products Co. in Memphis had a different engraving which reads chess 45•8378 PP and chess 45•8379 PP so the Memphis people could easily see to which label the disk belonged. According to discogs other copies read 45-8378 Δ 15319 and 45-8379 x Δ 15318 which is the code for the Monarch Records pressing plant in Los Angeles. There are also silver-top copies where the etching reads CH-8378 and CH-8379, though these may be 1970s re-issues. Note that the variety of labels known from Chess 1653 has also to do with the multitude of records needed. Some pressing plants had printers on site who created labels, some got them for external sources. But while the layout was probably given by Chess, the letter size and placement was done at the individual print shops. 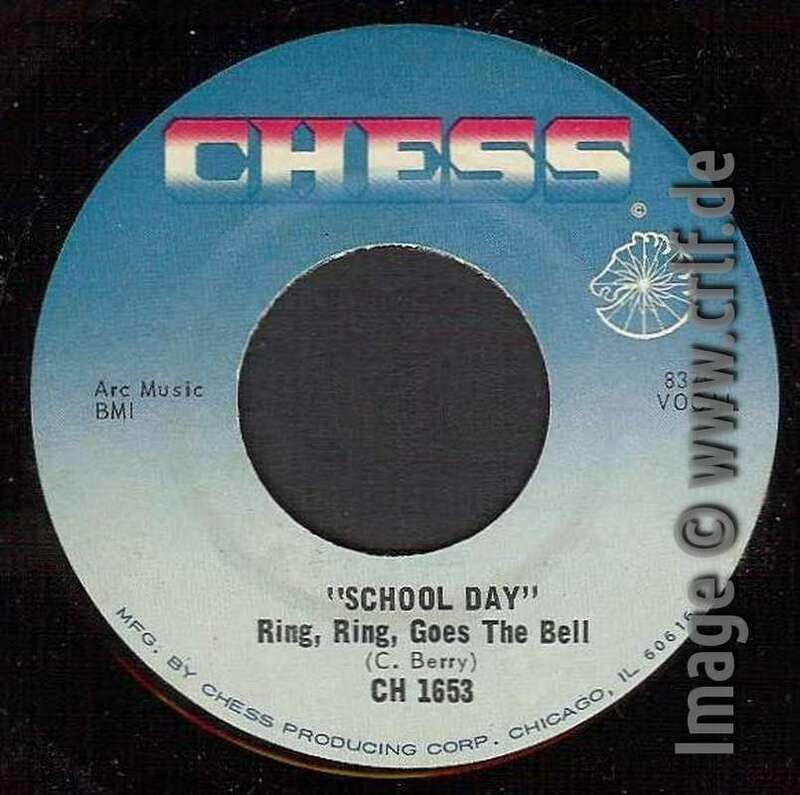 We know of silver-top labels having "School Day" within quotation marks and others that don't. Also some labels had a sub-title of (Ring! Ring! Goes The Bell) below the song name, others didn't. After its original success Chess 1653 has been re-produced often. There are re-issues with every type of label the Chess company used during the late 1950s, 1960s and early 1970s. Up to the mid-60s these re-issues seem to have been created from the original matrices having 45-8378 and 45-8379 engraved. 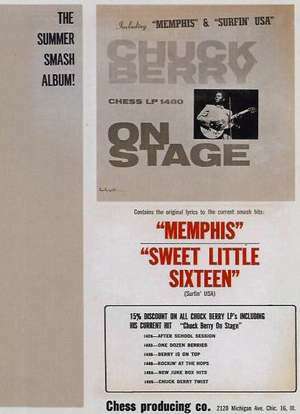 Sometime around 1965, Chess once more needed re-issues of Berry's old hits. However, they decided not to re-use the old lacquers but to create new ones from the master tapes. One reason was that the fad of the time required stereo records. So Chess tried to refresh the old mono records. They altered the sound electronically to make it sound like stereo. Judging from today, this enhancement was probably the worst they could do with the old master tapes, but they did. This new re-issue had a light-blue label. The catalog number reads "1653" as on the original 1957 release and the correct instrumental Deep Feeling can be heard. You can tell that new lacquers have been made by looking at the engraving of this variant. Instead of 8379 for School Day the etching erroneously reads 8370 here. For whatever reason, only a few years later Chess once again decided to create new lacquers, probably around 1967 and with even inferior sound. Again we can tell that new lacquers were made because this next re-issue has another new etching in the "dead wax" (8379 TM5416 CH1653 SG where TM stands for Chess'es own Ter-Mar Pressing Plant and SG might stand for mastering engineer Geoff Sykes). 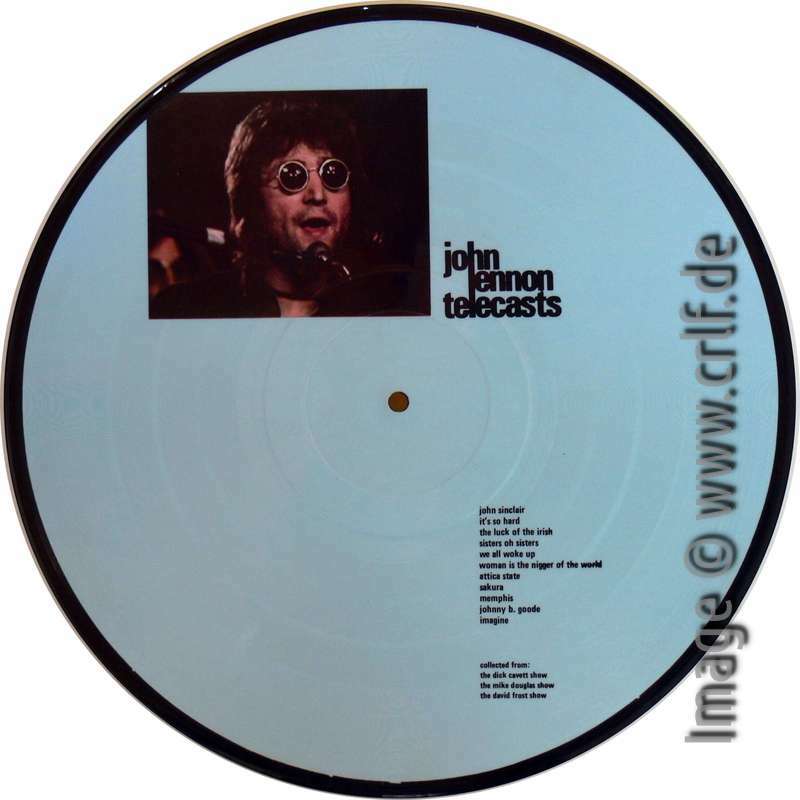 The label to this re-issue is almost identical to the light-blue one shown above. You can recognize these new ones not only by the TM text in the wax, but also by its label print. The records of this second set have the same light-blue 1960s Chess label but - most importantly - list a catalog number of "CH 1653". This is the interesting variant! On the B side this second light-blue re-issue not only has a different dead wax, it also has different grooves for the song! By error someone at Ter-Mar Recording Studios took the wrong master tape to cut the new lacquer. 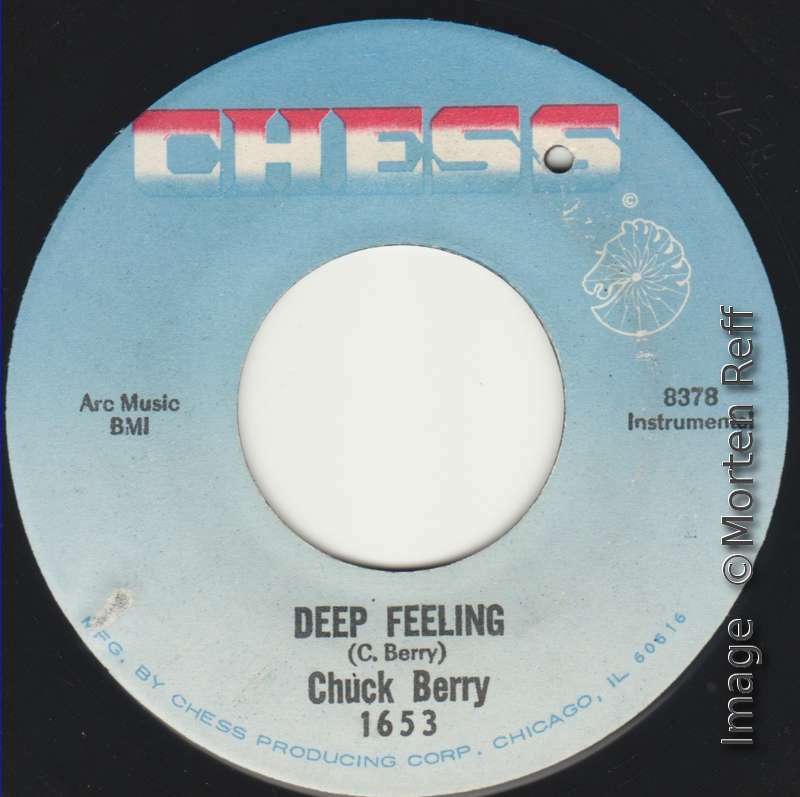 On this B side is a Chuck Berry instrumental, but it's not Deep Feeling! Instead they took the tape of master U7953 which is Berry Pickin'. The faulty lacquers went into production unnoticed and records were pressed. This must have been a time at the Chess company when somebody got totally confused over which master tapes to use for re-issues. Besides the incorrect pressing of Chess CH-1653 there exist at least two other light-blue re-issues with incorrect contents. Bo Diddley expert George White told me that he owns a light-blue re-issue of Chess 1744 (Howlin' Wolf - The Natchez Burning b/w You Gonna Wreck My Life) where the A side plays I'm Going Away instead. And he knows of a light-blue re-issue of Checker 819 (Bo Diddley - Diddley Daddy b/w She's Fine, She's Mine) where the A side incorrectly plays The Great Grandfather. So whoever was in charge at Chess when the light-blue re-issues were mastered, he either couldn't read or hear. Many thanks to Morten Reff and Thierry Chanu for their tremendous help with this article! In November 2013 we finally gave up. For decades Morten Reff and I had tried to find a regular copy of Berry's fifth single for Mercury It's Too Dark In There / Good Lookin' Woman (Mercury 72963). 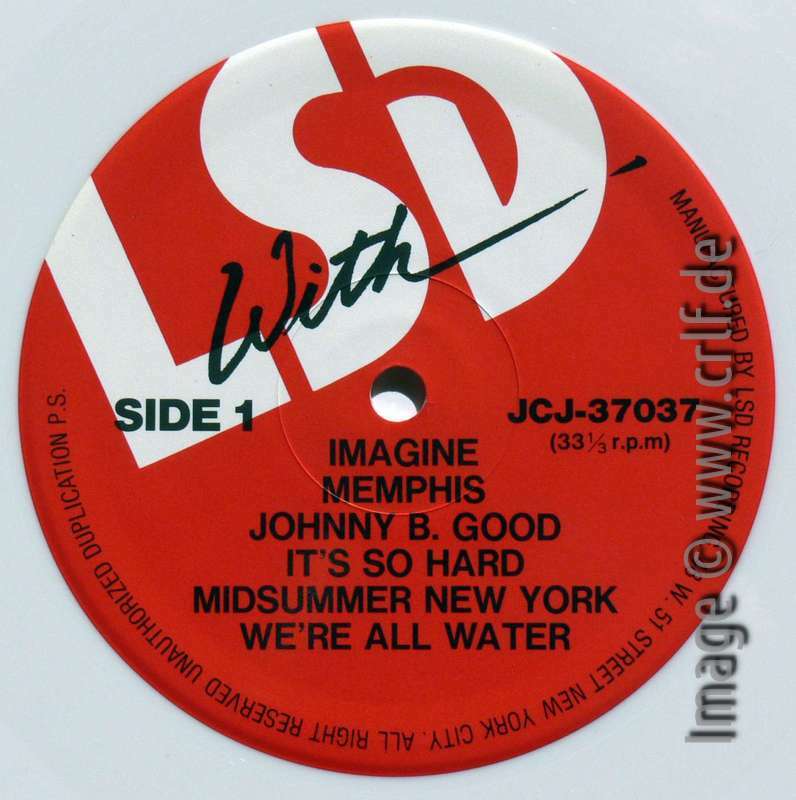 While you can buy white-label promotional (WLP) copies of this single easily, we never even saw a regular copy with the commercial Mercury label. Yes, it exists! Who else but reader (or shall I say contributor) Thierry Chanu found this absolute rarity! This is the only copy of Mercury 72963 having a regular company label we know of. It came to him in the paper sleeve of the promotional copies, Thierry remembers. A note on bootleg records first: A bootleg record is a factory-produced vinyl record released and sold without authorization by the artist or owner of the recording. Bootleg records may contain known recordings, but most often bootleg records either contained studio outtakes or live performances. 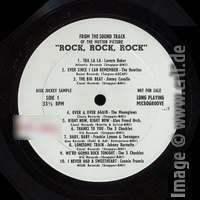 The first bootleg records were seen at the end of the 1960's. 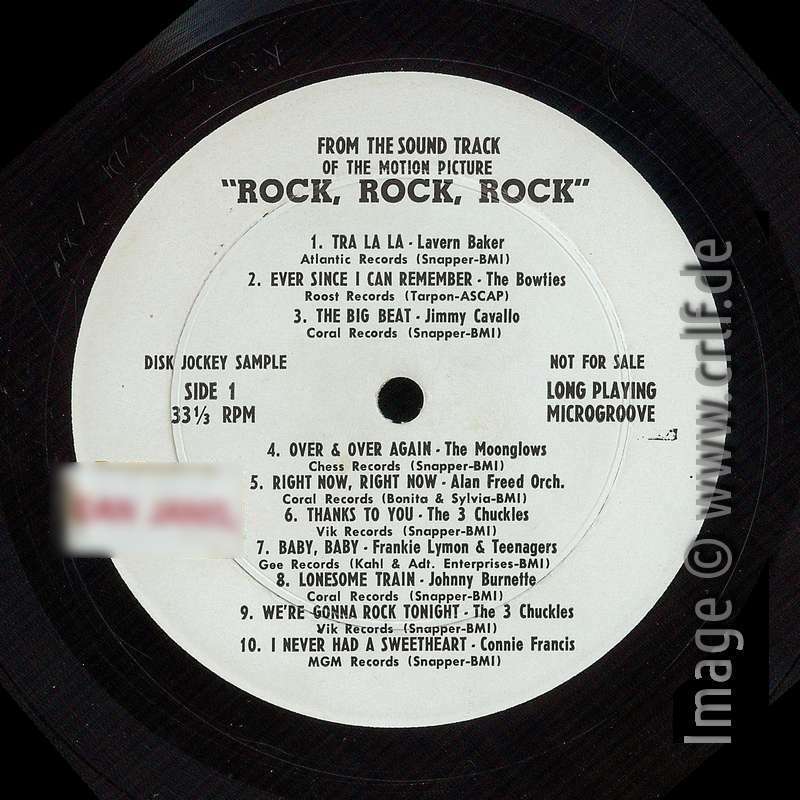 During the 1970's and 1980's lots of different bootleg records were produced. In the early 1990's bootleggers changed to use CDs instead of vinyl records. I do not encourage the production and sale of bootleg records as I find that artists, composers, producers, and the rest of the recording industry deserve a financial compensation of their work. 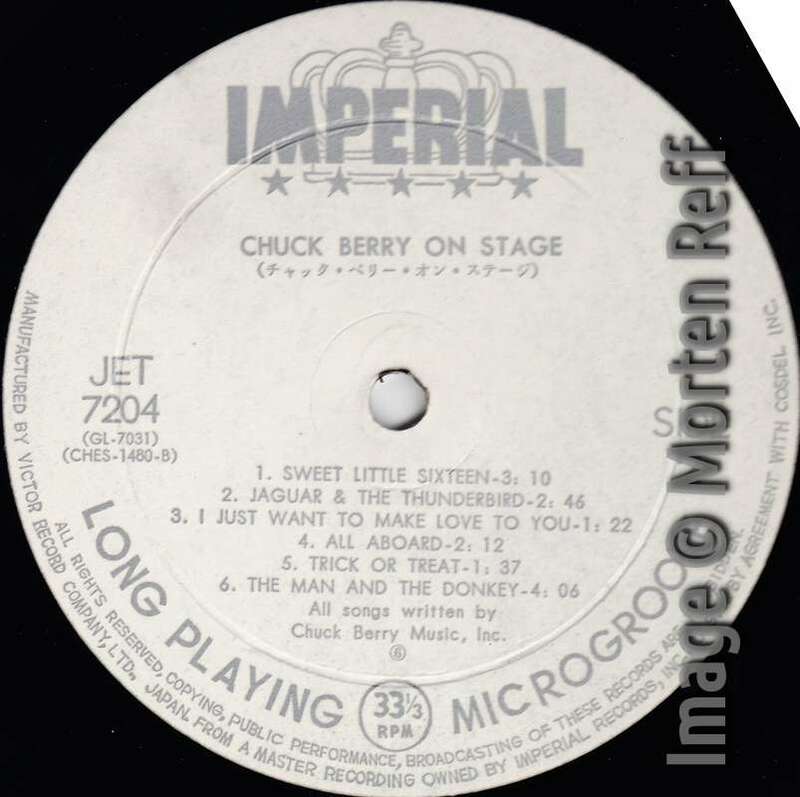 This series of articles is going to describe the Chuck Berry vinyl bootlegs released in the 1970's and 1980's. For any record collector these items are important to know of, even though you don't necessarily need to have them. Omitted from all the usual discographies, information about these records is next to void. Given the secret nature of the bootlegger business there are no exact dates, numbers, or origins. I have tried to collect this information from various sources and mostly from my own collection of records. If you can add anything of worth to the information given here, I'd be glad to know! This is the fourth part of this series and it covers a record which isn't really a Chuck Berry bootleg. 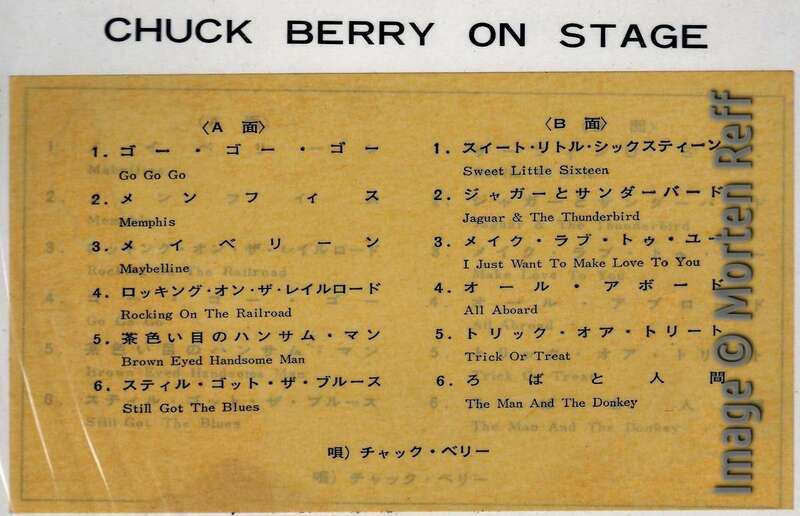 Of all bootleg records containing unreleased Chuck Berry recordings, this one is probably the best-sold and the one of which the most variants exist. This is because it's not a Chuck Berry bootleg at all. 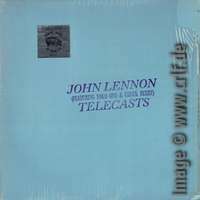 Telecasts is a John Lennon bootleg, but it contains two recordings from the Mike Douglas TV show of February 3rd, 1972. 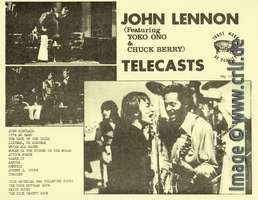 In this show, co-hosted by Lennon, the ex-Beatle invited Berry as a guest performer. 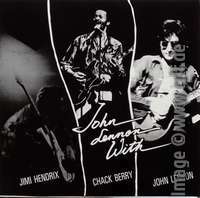 Two songs were recorded, Lennon and Berry singing duets backed by Elephant's Memory and Lennon's wife Yoko Ono: Memphis, Tennessee and Johnny B. Goode. Further segments from the show such as an interview with Berry and a cooking scene did not make it to this bootleg. During research for this article, I learned a lot about bootleg creation in the 1970's. I strongly suggest you take some time to read the excellent blog The Amazing Kornyfone Label. If you follow closely the stories of Ken Douglas, one of the most famous early bootleggers, you'll learn that research is almost impossible. They never thought about getting their acts organized in any business sense. Which makes it more or less arbitrary how the records looked like. The color of the vinyl, for instance, was more or less random. The record pressing company just used what was lying around. Even in the same production run multiple colors were used. The same with labels or covers: any color, any print. Early bootlegs had their name placed on blank covers using a rubber stamp, but if there wasn't enough time, only some were stamped, others not. 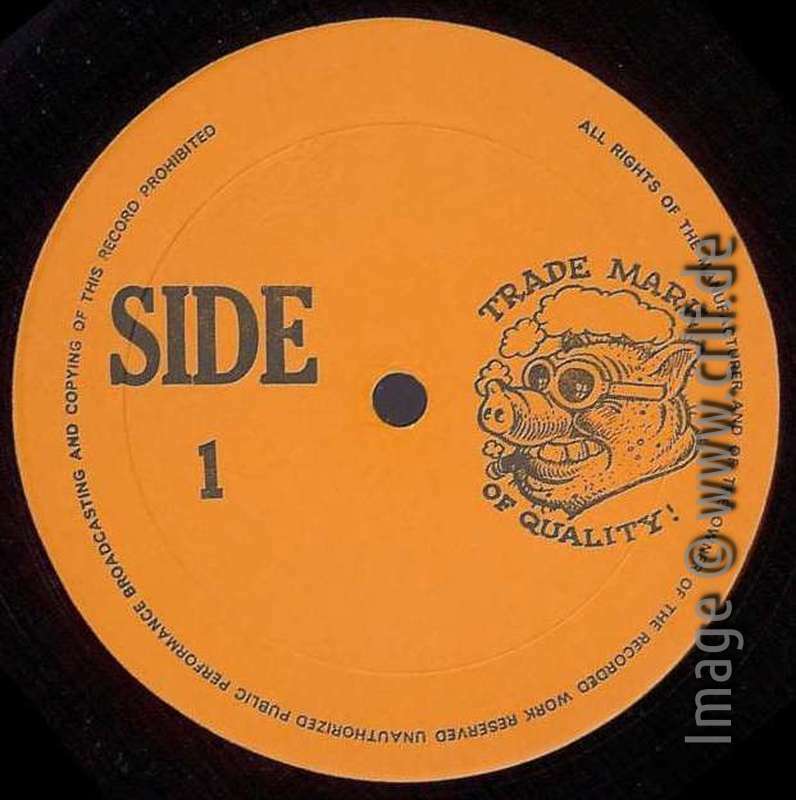 Due to this, bootlegs from Ken's Trade Mark Of Quality label (and others) exist in dozens of variants and no-one can tell which ones were produced when or in which quantity. Here is what I think might be the most probable history of this Berry bootleg. It seems that the very first version of this bootleg was produced by the legendary Los Angeles-based bootleg label "Trade Mark Of Quality". The exact date is not known, but is must have been by the end of 1972. At that time the operation was run by Ken together with Dub Taylor. They used a so-called "Farm Pig" logo on stickers, inserts, and (sometimes) labels. The initial release had a catalogue number of TMQ 71046 which was printed on an insert (xeroxed on color paper). 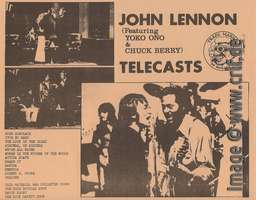 It came in a white or colored cover with or without a rubber-stamp reading "John Lennon (featuring Yoko Ono & Chuck Berry) Telecasts". Labels seem to contain the Farm Pig logo, but also other labels exist. Note that TMQ 71046 has been copied in later years with no or little difference. This means there are bootleg copies of this bootleg. The matrix number etched in the dead wax of TMQ 71046 reads JL-517 A/B. It's not quite clear what this number stands for. JL of course is short for John Lennon. 517 seems to be some internal numbering at TMQ. There is for instance a Bob Dylan bootleg numbered BD-516. 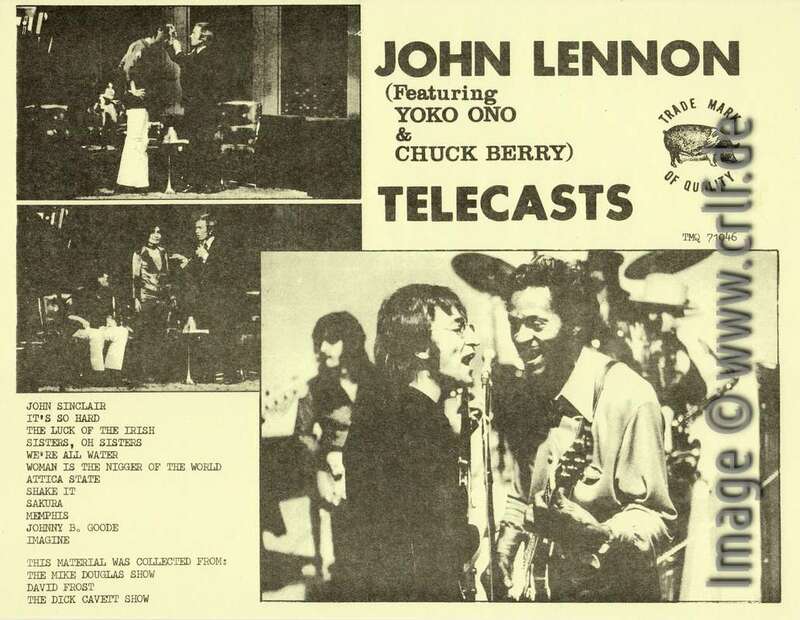 The letter-sized photo-copied insert on colored paper contains poor quality photos from the shows including Berry and Lennon performing together. 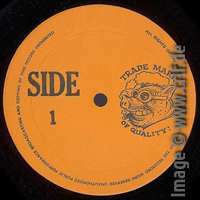 Shortly after the initial release of TMQ 71046 the owners of the label (if you can call them 'owners') split and formed separated bootleg labels. Ken Douglas continued using the Trade Mark Of Quality name. These second version records show a different TMQ logo, though. 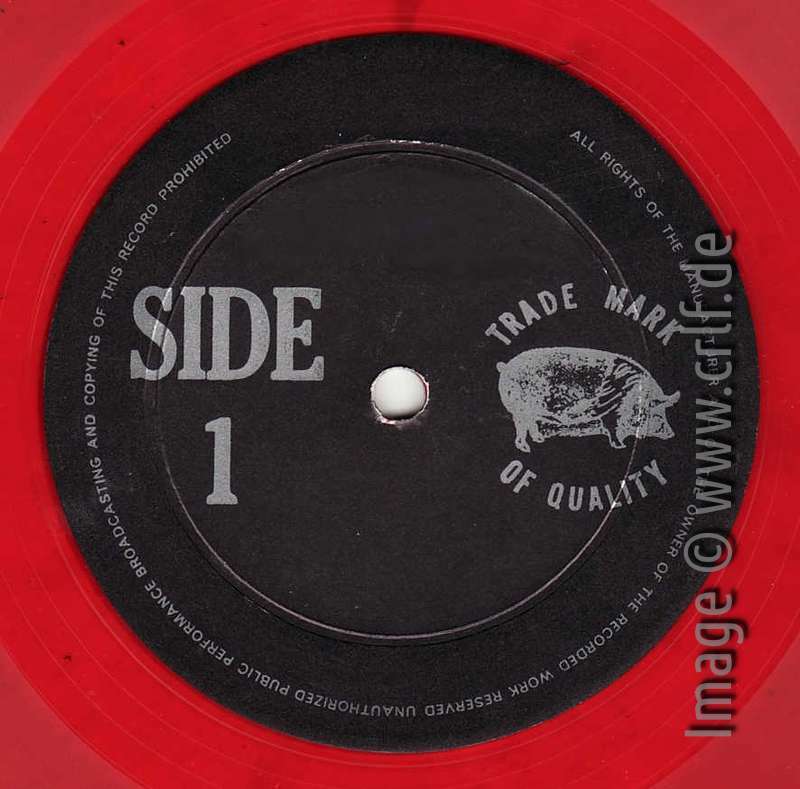 While the original label had a so-called "Farm Pig" logo, the second version uses the so-called "Smoking Pig" label. Douglas re-used the original tapes to produce his own TMOQ records. 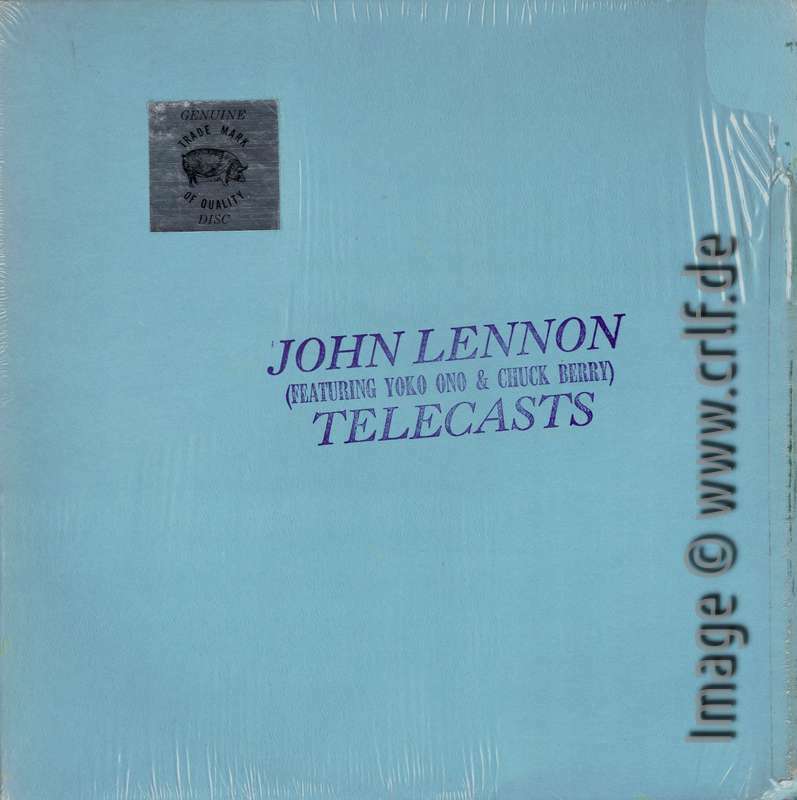 The second variant of Telecasts has the TMQ number 1834 which is etched in the dead wax. Thus a different matrix was used. It came in completely white covers. Both the insert and the labels show the Smoking Pig logo. Concurrently with the TMQ release(s) or not much later (appr. 1973) another variant of this bootleg has been produced from yet another matrix. This time the etching reads WEC-3711. The "company" is known as Contraband Music but this name doesn't appear on cover or label. The cover is blank with a full-size insert in brown on white. The labels are white with a rubber-stamped A and B. The original TMQ matrix with the etching JL-517 (or copies thereof) has been used very often. This record exists in a multitude of covers and comes with a multitude of labels. Here's one example of a modified insert. This version had plain green labels. This may be a later or even an earlier version. Have a look at Bob's Boots discussion of TMOQ cover and label variants of a Bob Dylan bootleg. 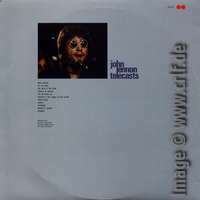 For more variants of JL-517 see images here (Great Live Concerts 6012-4299) and here (Box Top Records). 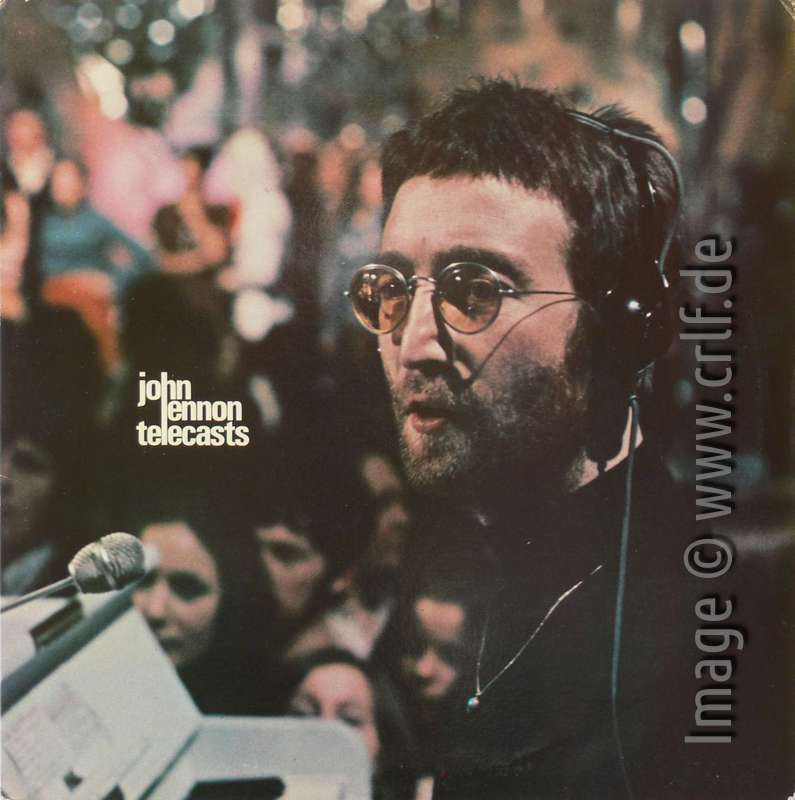 The best known version of JL-517 is the one with the full-color photograph of the bearded Lennon sitting at a piano in front of an audience. This version also has a full-color back cover. It is this cover on which the bootleggers first forgot to list the second track from side 2 "Shake it". The song is only missing from the track listing. On the record it still is. This error has been repeated ever since. The labels of the photograph version are blank white. 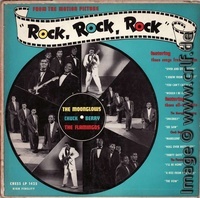 Both cover and record have been reproduced often. 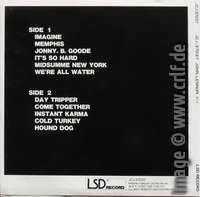 One version has a dog label (image at discogs here). 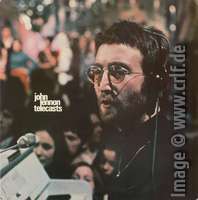 In addition JL-517 has been used to produce one of the records in two-, three- or even nine-record sets such as John Lennon - Flower and John Lennon - The Plastic Ono Box. The full-color photo from JL-517 has also been used to produce a picture disk. 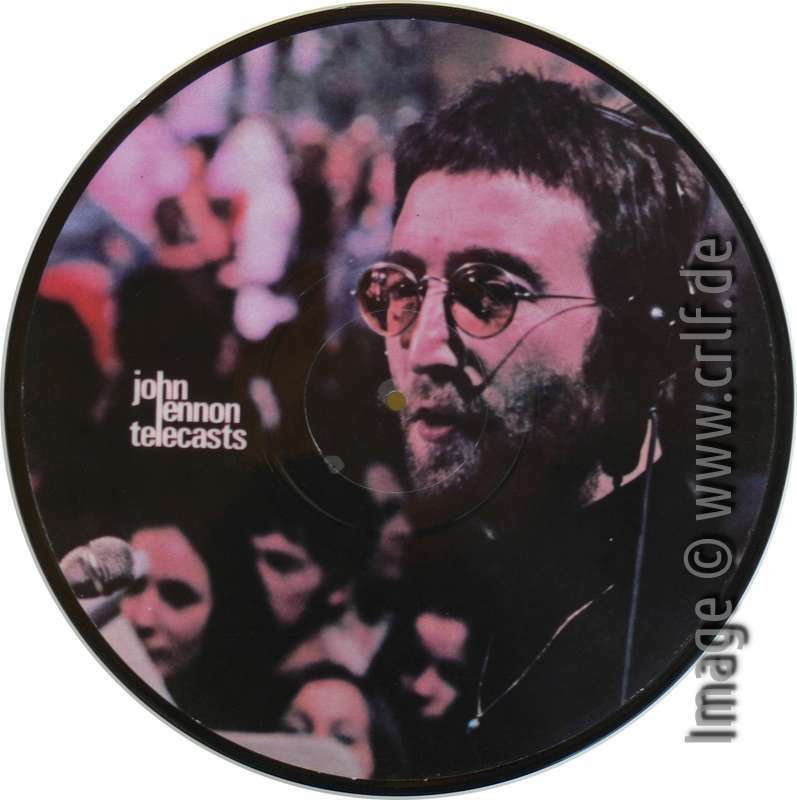 A picture disk is made out of transparent vinyl with a full-size print in between the two layers for the two sides. One should note that for the picture disk an even different master has been used (probably due to production reasons). The picture disk is etched 4-A and 4AB in the dead wax. While Telecasts was the first bootleg containing the two Lennon/Berry duets, the same recordings have been used on other, later bootlegs as well. 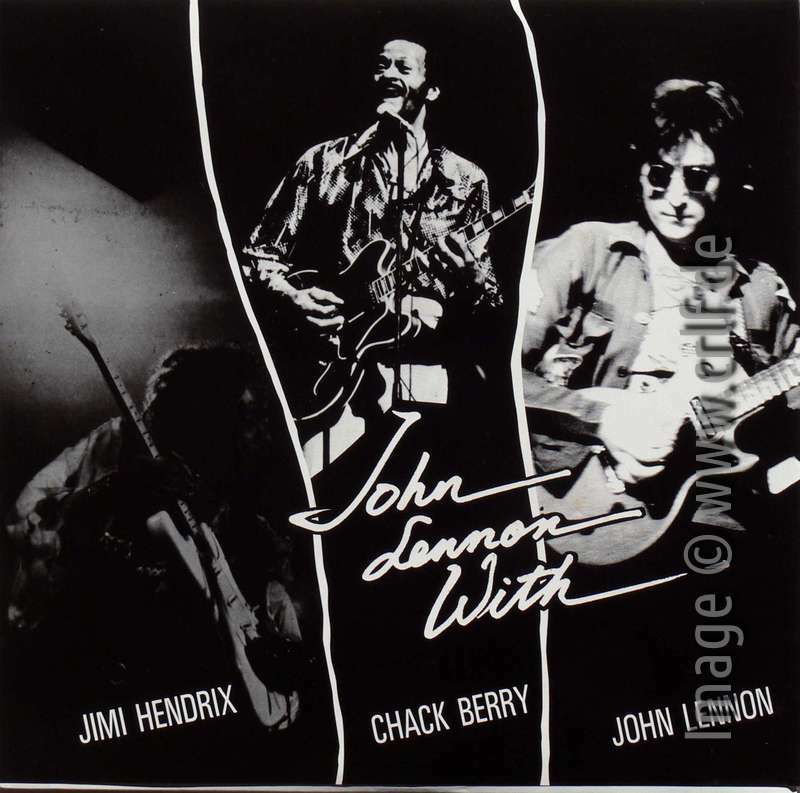 These contain different remaining Lennon recordings, typically other duets with Jimi Hendrix or Elton John. 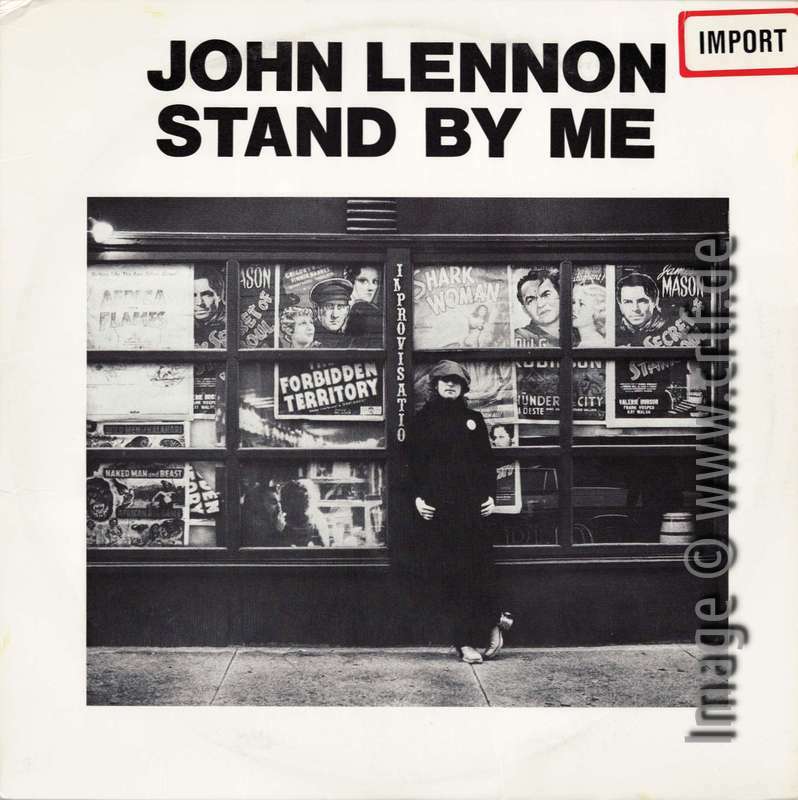 Examples of such bootlegs are the two LP set Working Class Hero (Chet Mar CMR-75, image), the Australian two LP set Stand By Me (Toasted Records TRW-1942, see below), and the single LPs The Joshua Tree Tapes (The Kornyphone Records for the Working Man TKRWM 1803, Johnny B. Goode only, image) and John Lennon with (LSD Record JCJ-37037, again see below). 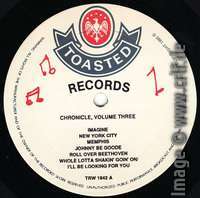 The Toasted Records cover tells that there's a third duet from the Mike Douglas show (Roll Over Beethoven). This is incorrect, though. There's no Chuck Berry on that recording. 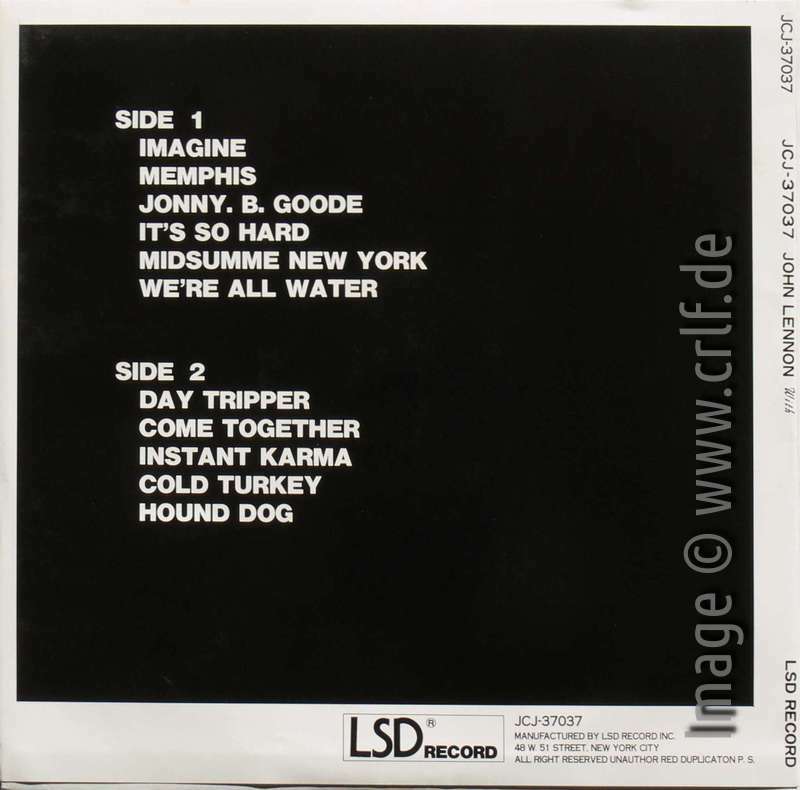 Also note the spelling of Chuck on the LSD Record cover. 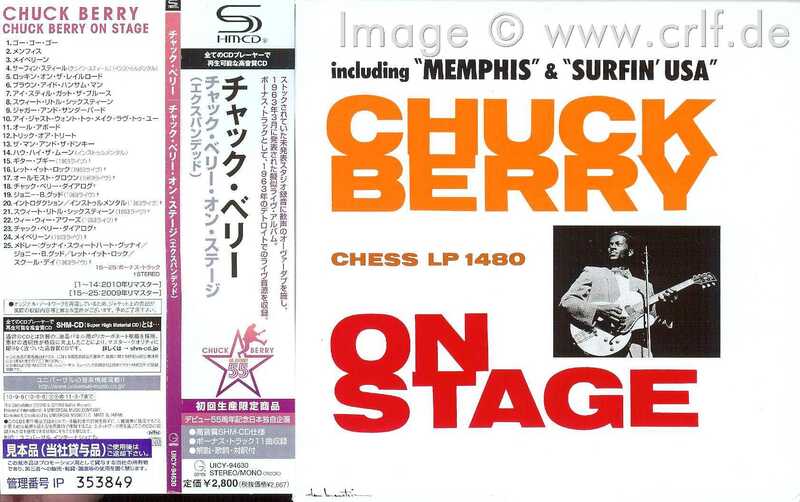 A (probably) legal release of the two songs plus the interview with questions to Berry, Lennon, and Ono was released in 2011 as a three CD set called Chuck Berry in the 1950s (Chrome Dreams CD3CD5073, 2011). You can also buy DVDs containing the complete show. 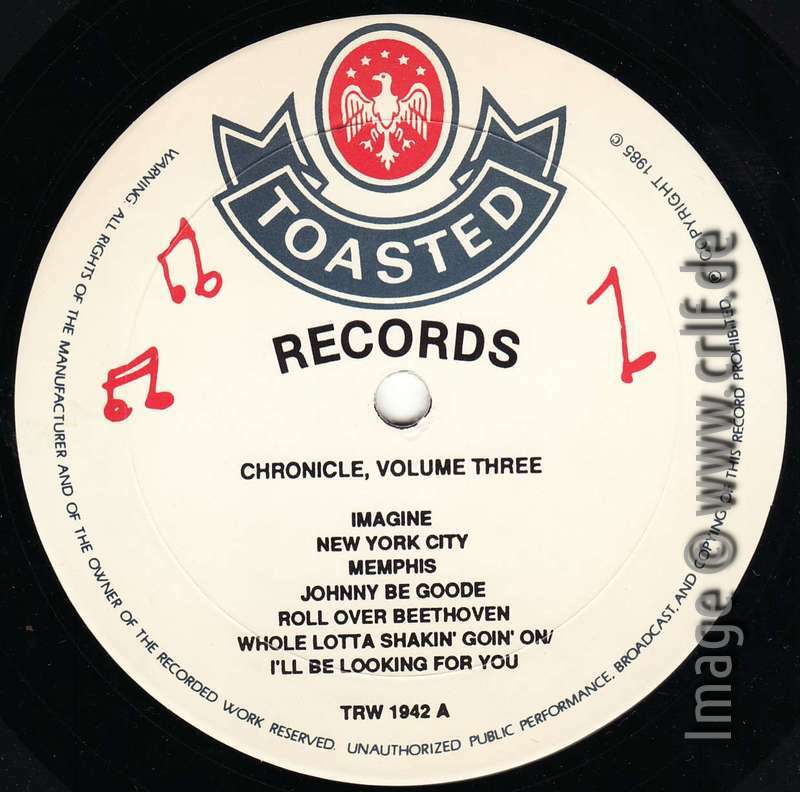 Thanks to Morten Reff for photos of the original TMQ record and the Toasted bootleg. All other images show records from my own collection. This is the third part of this series and it covers another typical kind of bootleg record: a record containing studio outtakes. Besides live concert recordings, the most interesting bootlegs are those which contain studio material not to be found on legal releases. Typically these are outtakes or versions of songs not good enough to be officially published by the record companies. You may wonder how bootleggers can get access to such unreleased material. There are many ways. Sometimes the artists themselves give tapes out of hand, sometimes the housekeeper find some tape in a paper bin. In this case chances are that this comes from a tape an interviewer claimed to have heard during a Keith Richards interview in 1978. (see below) Until 1977 Marshall Chess, son of Leonard Chess, ran Rolling Stones Records and it might well be that he had access to Marshall father's archives. 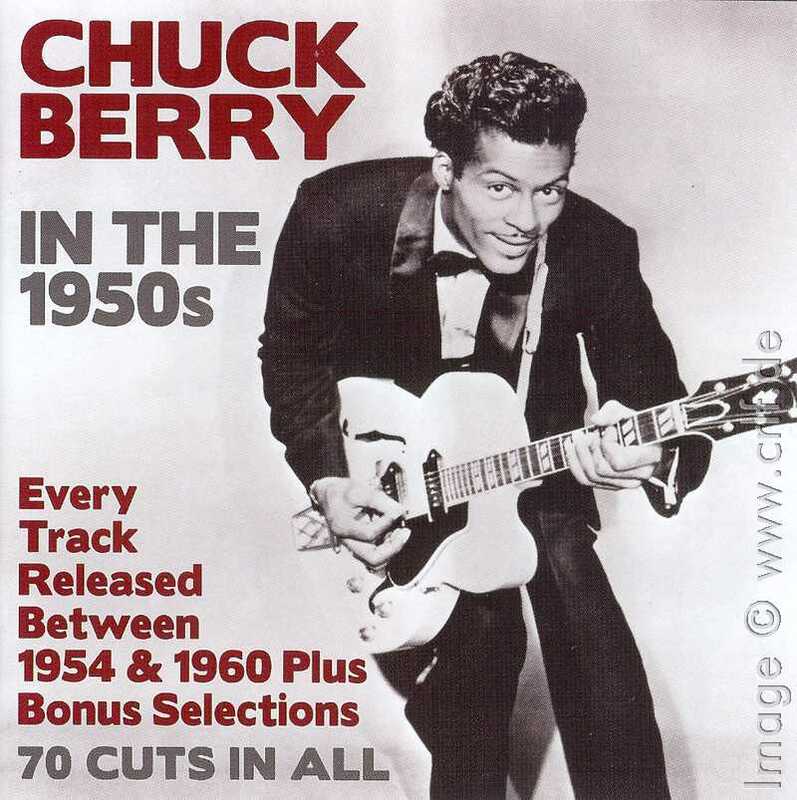 Anyway, this record contains ten Chuck Berry recordings from the 1950's and early 1960's which had not been released before. There were two additional recordings which had been released before but only with fake audience noise. And there were two recordings released by the vocal group The Ecuadors on which Berry's contribution hadn't been known before. Three variants of this bootleg exist. One of these is not a bootleg at all. The first variant had a blank white cover onto which record as well as label name and number Reelin' 001 were rubberstamped by hand. The labels are completely blank and have a light pink color. The master number as etched into the dead wax reads CE 70/1. My copy didn't have any other information with it. Morten Reff was so kind and sent me a copy of a sheet of paper which came with his record. The sheet contains nothing more than the track listing and a few details about each song. Morten Reff dates this bootleg at appr. 1979 and variant 2 (below) to 1980. To me variant 1 looks at least some years older. Label and cover look more like an early 1970's bootleg. Variant 2 has a fully printed cover, a printed label and liner notes. And it shows more than a dozen previously unreleased photos (also from the Chess archives?). The front cover tells artist and record name. Also it says "rare and unreleased tracks 1955-1963". The label name is now written as reelin' with a lower-case R.
Next to the photos and track listing the back cover contains a quote from an interview with Keith Richards, printed in the January 1979 issue of Rock&Folk magazine in which the interviewer claims to have listened to a cassette tape containing some of the recordings included. This quote places the publication date of variant 2 to 1979 or later. This is a complete new record from a new master disk. The etching on the dead wax now reads 001-A/B. It is interesting to note that the printed track listing on the back cover differs in some details from the insert sheet of variant 1. And even more interestingly variant 1 contains the more correct information. Among the errors on variant 2 are the spelling of the Ecuadors and suppressing the previous release of the dubbed tracks. The same errors were repeated character by character when in 1983 CHESS (UK), at that time a label of PRT Ltd., released CHESS CXMP 2011. Probably due to the huge success of the bootleg, CHESS (UK) decided to release the exact same contents on an official album. The cover does not tell so. It calls the record just "Chuck Berry" as part of PRT's "CHESS masters" series. However, when you look at the record labels, you'll see the name "America's Hottest Wax" printed. One has to note that while the official CHESS (UK) release contains the exact same sequence of the tracks, they do not always sound exactly alike. Sometimes the songs on the official release fade later than on the bootleg. This might point to the fact that PRT indeed used the original CHESS tapes for mastering this album. This is the second part of this series and it covers a typical kind of bootleg record: a live show recording. As typical for many bootlegs, the Six Two Five bootleg origins from a live show. 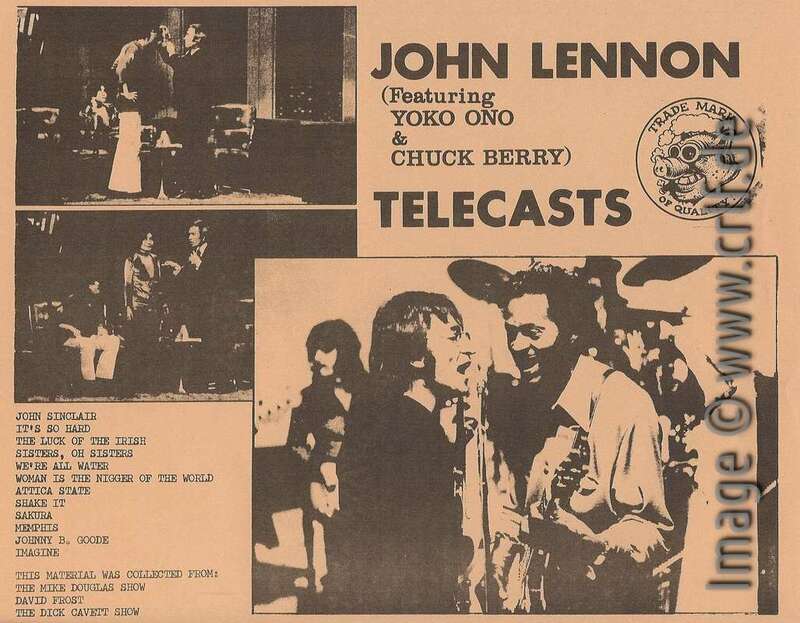 Here it's Berry's concert for British Broadcasting BBC held at the BBC TV Theatre, Shepherds Bush Green, London, UK on March 29th 1972. Most concert bootlegs stem from professional recordings made during the concert, either cut directly from the mix or soundboard or produced for radio or TV broadcast. We don't know the exact origin of this concert recording, but the quality is high and the contents is exactly that of the original 45 minutes TV broadcast by the BBC. Thus it may have been cut from the TV transmission or directly from the edited BBC tape. Two vinyl variants and one professionally made CD of Six Two Five exist. All show the exact same black&white photo of Berry shot from a TV screen. Also the font and placement of artist name and record title are the same. The three variants differ in the print below the photo. Variant 1 reads Driving Wheel 1001 in the lower right corner. The lower left corner displays the Driving Wheel logo. The cover itself is blank white, the cover image is printed on a yellowish paper almost the size of the cover. The paper is glued onto the front cover. It is not clear if the sheet containing explanations and track listing was separated from the cover initially. My copy has this sheet cut to 163x170mm and glued to the back of the cover. It has some sentences about the BBC show including the very interesting telling of a list of songs played but not broadcast. This list can only come from either the BBC themselves or from someone who was present during the original concert. Besides this, the back sheet names the album An 'S F T F' Production and lists five 'names' for which credit's due. In addition to the sheet there's also a blue number stamped on the back cover. I don't know if this is the individual copy's number or the produced quantity, probably the former. Mine reads 00400. 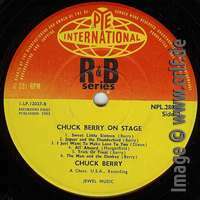 While all of the songs as well as Berry's stage banter are very worth listening to, especially because Berry used a band, Rocking Horse, he had practiced with during the week before, the most interesting number is Berry's version of South of the Border, or South of Her Border as Berry puts it. 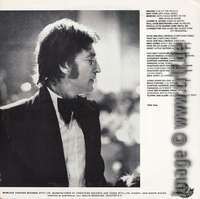 This is the only song from this concert which has been released on an official record: Chess (UK) 45rpm single 6145027. 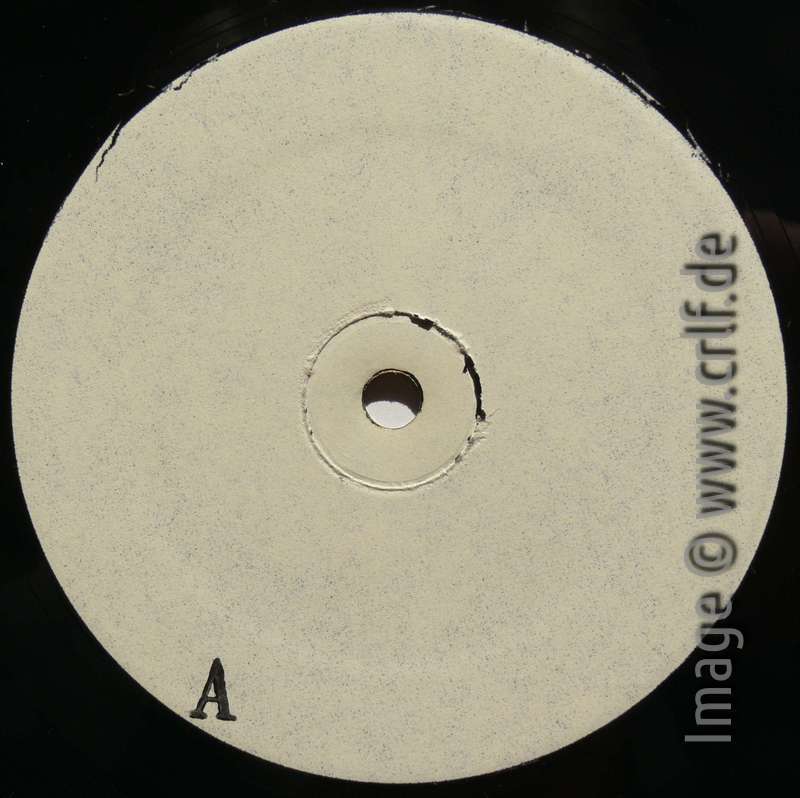 The Driving Wheel bootleg has a simple label reading only Side One / Side Two and 33 1/3 RPM. As you can see, the record is pressed in a purple-colored vinyl. An interesting detail is the etching in the dead wax of Driving Wheel LP 1001. It reads DWLP-721-A/B. It is quite probable that 72 refers to the year of production. We'll return to this etching in a minute. Variant 2 of Six Two Five has almost the exact same cover. The same size front sheet is now printed on white paper. The main difference is that the text Driving Wheel 1001 is missing from the lower right corner. The Driving Wheel logo itself is there, though. The back cover is blank and to my knowledge there wasn't any insert or back sheet. The track listing is part of the record labels only. 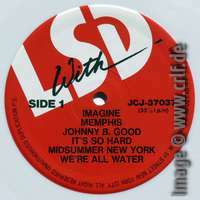 Here you can see that this variant was released as MBL 676 on a label called Maybelline Records. Again the number 676 might point to the date of production. As I said, it's interesting to look at the etching in the dead wax. On this record it reads DW1001A/B. This makes it clear that this record was produced using a different, a new master disk. The reference to DW1001 makes me believe that for mastering the Maybelline bootleg they used a copy of the Driving Wheel bootleg as the source - and not the original tape. In the early 1990's yet another variant of Six Two Five appeared. This time it was a factory produced CD. The front cover still looks the same. Only the lower parts are cut off and a label name ARCHIVIO is inserted. The catalog number is given as ARC 001. According to the print on the CD and a red stamp on the back cover this CD was Made in Italy 1991. As with all the information printed on bootlegs this is not to be taken too seriously. By listening to the CD it becomes very probable that also the CD master was created from one of the two vinyl editions. 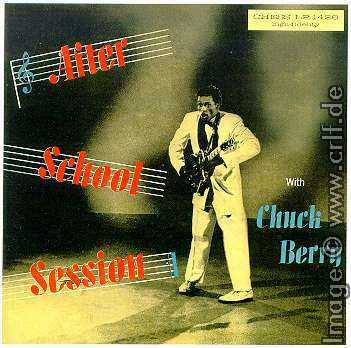 Let's begin this series with the record I use for the thumbnail of the Chuck Berry Rarities section of this blog. 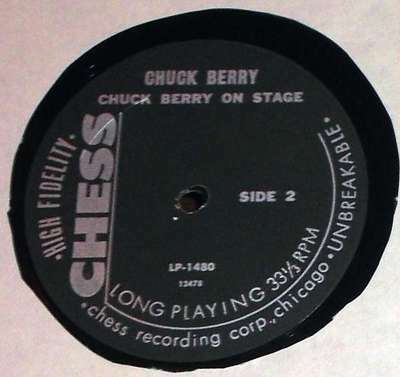 This may be the first Chuck Berry vinyl bootleg, or not. As with most of the early bootleg records, Rare Berries did not have a printed cover but instead came in a plain white envelope. Attached were two sheets of paper which are black and white photocopies. All copies of this record I have seen so far have these sheets glued to the two sides of the record cover, so I don't know if they were delivered loosely initially. Both sheets don't have any standard paper size, so it's quite possible that they were already glued on the cover at their initial sale. The front sheet shows a (poor) photo of Berry. He wears the colorful stage outfit he used to wear by the end of 1972 and early 1973. So this indicates a production date of not earlier than 1972. And probably also not much later as fully printed covers became common with bootlegs in the mid 1970's. In addition the front sheet (225x292mm) tells the artist name in capital letters, the record name in all lower-case letters, the logo KOZMIK and the record number KZ-501. 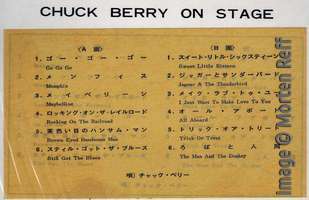 The back sheet (207x283mm) repeats label, artist and record name. 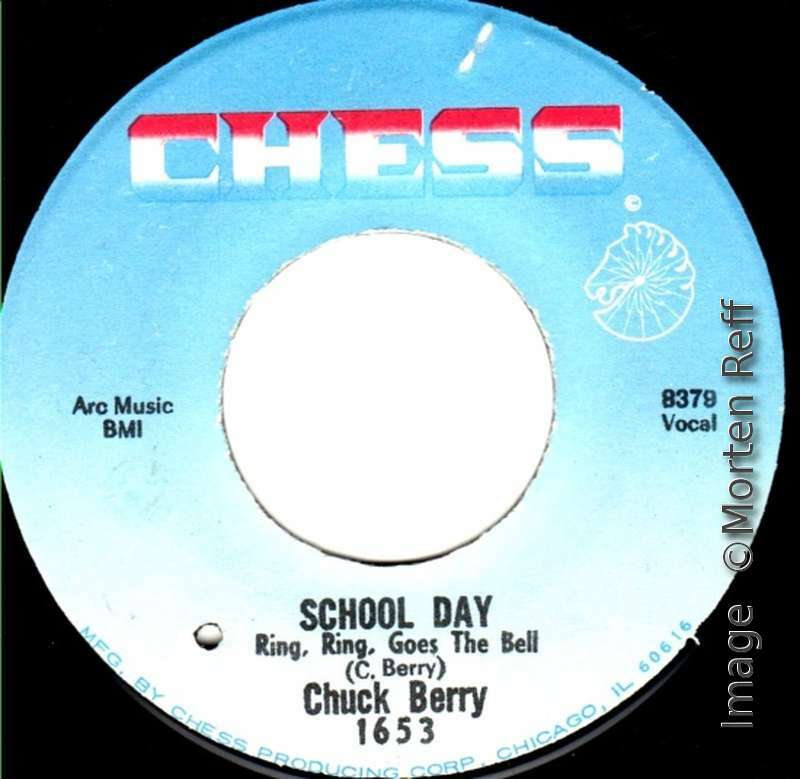 Next is a sentence explaining the record as "A Limited Edition album, featuring Chuck Berry's most obscure recordings, taken from the outset of his musical career." Following is a track listing and discographical details of the recordings. As you can see from the track listing, these are not the usual bootleg recordings. Instead of unreleased studio stuff or obscure live recordings, this album contains nothing more than previously released Chess material, though some of the lesser known. But definitely not 'rare'. All of these recordings could have been found in used-record shops even in the 1970's. 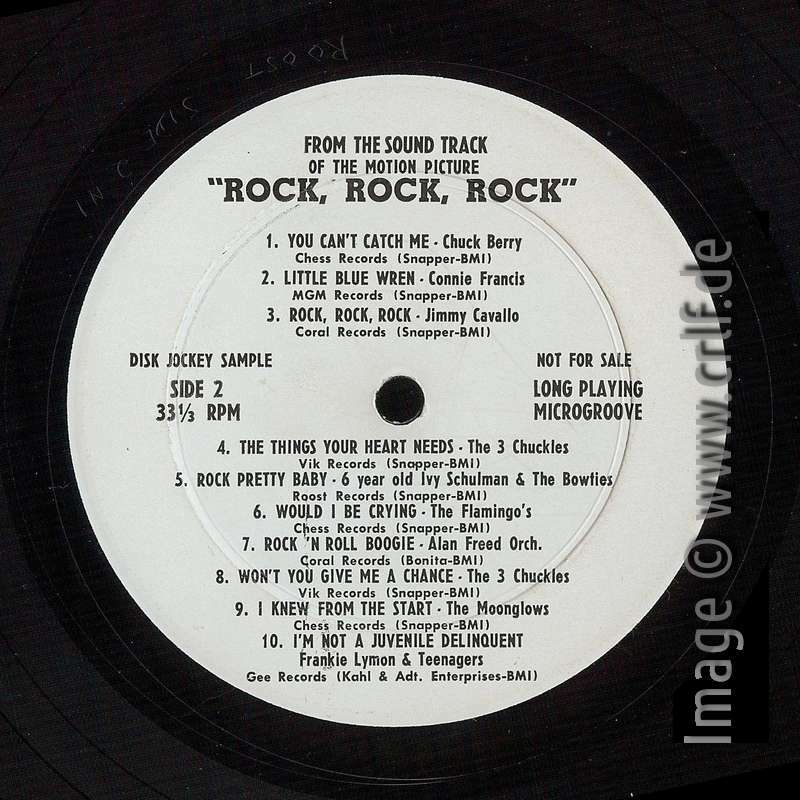 No later than with the release of Chuck Berry's Golden Decade Volume 3 in 1974 almost all of these tracks were commercially available even on new records. Therefore I would date the release of Rare Berries to 1972 or 1973. There are at least two different variants of this bootleg differing by the record label print. This points to at least two production runs. Variant 1 has green labels. The text is written with a typewriter, the label name is written using a lettering guide. The labels must have been created in haste as they even did not re-type the B side label after mistyping £ for a 5 in the record number. And on Side A they weren't even sure of the (probably conceived) label name: Where the front sheet and Side B spell KOZMIK with a Z, the label of Side A has KOSMIK with an S.
Variant 2 has a much more professional looking multi-colored label. Besides the consequent spelling of KOZMIK it also tells 'Mono', '33 1/3 RPM', 'Jewel Music' as the song publisher, and the standard saying that 'copying of this record is prohibited'. If one wouldn't know better (and would miss the cover), this could be mistaken for a legitimate release. Interesting is the hint to Jewel Music Publishing, Inc. which was Chuck Berry's publisher in the UK at that time. This could point to the origin of this record. Both variants seem to have been produced using the same master disk. The etching in the dead wax reads 'KZ 501 A/B' on both records. This blog article is a true collaboration between Morten Reff and me. 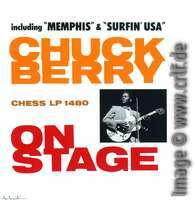 Here are the results of our joint research on Chuck Berry On Stage, the original CHESS album from 1963. 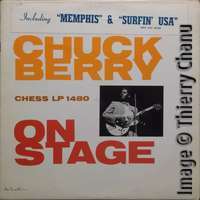 The original pressings of this LP had a sticker on the front cover saying 'Including "MEMPHIS" & "SURFIN' USA". So when in August I found an eBay offer of a copy having the title sticker, Morten did not hesitate to buy it - even though it was quite expensive. So how does a later vinyl make it into the original first sleeve? Two answers are likely: Between 1963 and 2014 someone might have replaced the original vinyl with a repressing, given the original record being defect or broken. Or, as Morten knows, CHESS usually pressed more covers than vinyl albums, so what they had available were used. Thus in the factory someone might have taken an old original cover from the box at the bottom of the stack when packing the newly pressed albums. We can only speculate on this. But what is even more interesting to know is: "Have there been sold any copies of this album which neither have the printed text nor the sticker?" We won't remove the sticker from this valuable album, but we both expect it to have no printing under the sticker. 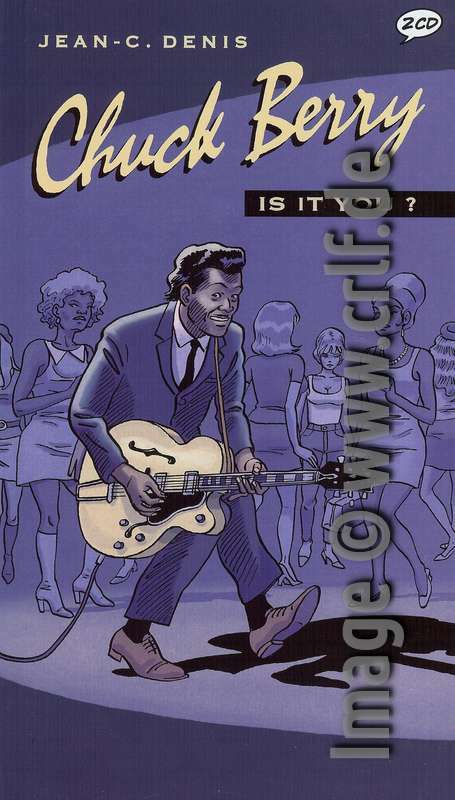 So we think the very first printings of the cover did not include any reference to Memphis or Surfin' USA. What we now found, might indeed not be the very first variant of this cover. It might already be a second variant, 'enhanced' with the title sticker. 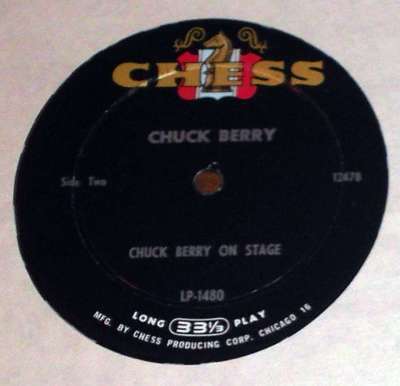 So our question to all Berry collectors reading this blog is: Do you have a copy of CHESS LP 1480 which has no sticker and no printing of the 'including' text? If you do, send us an image and we would be happy to show it here. During this discussion, we also found that while neither this site nor Morten's book could have shown the sticker variant of the cover, we also failed to show the correct non-sticker variant. On my site I had a later French reissue (which was then also pirated to Wikipedia), Morten's publisher included by accident the British Pye version. The correct second (or third) cover variant has the label name and number prominently right next to the photo as it can be seen here. Sorry for that. So here's what should have been in the book and on the site. 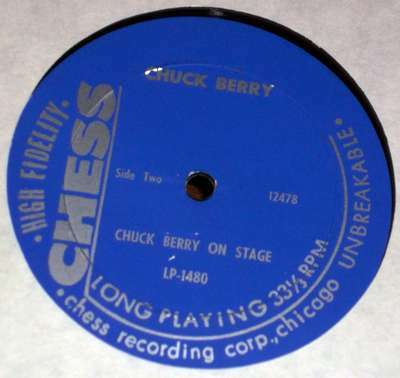 What was the very first 33rpm LP album containing Chuck Berry? If your answer was "After School Session", you know your Berry quite well. 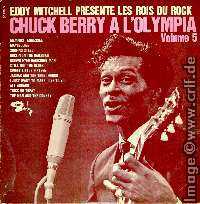 Indeed, this album from May 1957 was the very first 33rpm LP containing just Chuck Berry recordings. 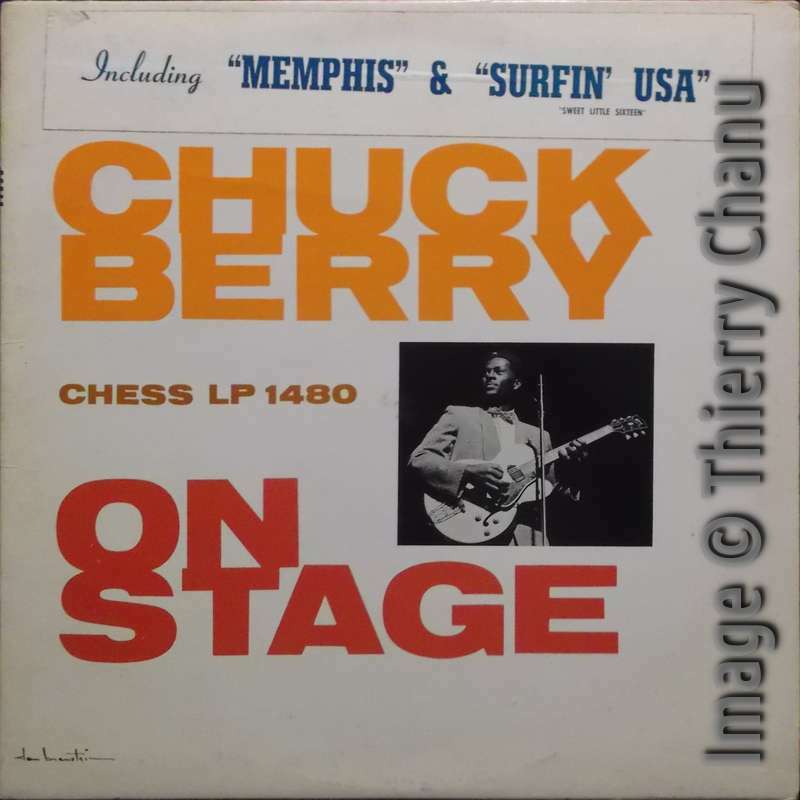 Released by CHESS under the catalog number LP-1426 this album contains most of Berry's first seven CHESS singles (except four tracks) plus two previously unissued instrumentals. However, this was not the first 33rpm LP album containing Chuck Berry. If your answer was the CHESS sampler "Rock Rock Rock", you know your Berry very well. Yes, as the number LP-1425 indicates, this album was released before LP-1426 "After School Session" und it was the very first 12" LP album published under the CHESS label name. In case you wonder why the first CHESS album was already numbered at 1425, you'll find the answer in Nadine Cohodas's great book "Spinning Blues into Gold": The Chess brothers' first home in the U.S. after immigrating from Poland was at 1425 South Karlov Avenue, Chicago. The number 1425 was also used for the first 45rpm single issued under the CHESS label name: Bless You b/w My foolish heart by the Gene Ammons Sextet in June 1950. 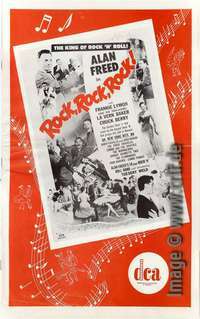 "Rock Rock Rock" is the title of a music film starring Alan Freed. The film was released December 7th, 1956 to the movie theaters in the U.S. (though some sources say December, 5th). On the very first days, Alan Freed, Chuck Berry, and Connie Francis were on stage in a couple of New York theaters for a few minutes each to promote the film. 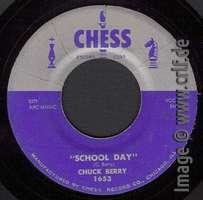 Record labels such as CHESS, whose artists performed in the film, were allowed to promote their records at the cinemas showing the movie. CHESS took this opportunity to concurrently (i.e. 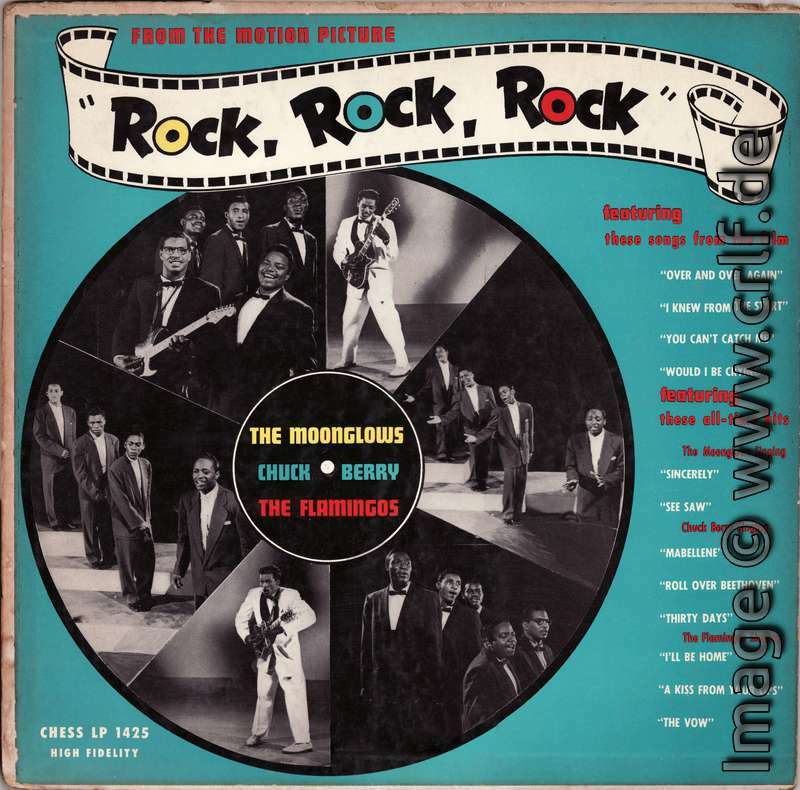 December 1957) create an album of same title which looks like a soundtrack album but instead contained only those artists under contract by CHESS: the Moonglows, the Flamingoes, and Berry. 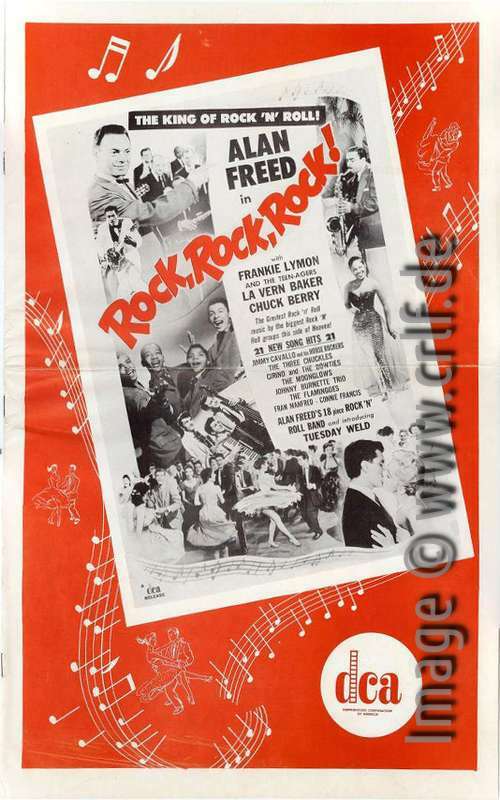 The movie "Rock, Rock, Rock" was a project by well-known New York disk jockey Alan Freed. And he wanted to get as much money from it as he could. First he owned 10 per cent of the film outright. Second he played a leading role. And third he planned to cash on the music presented therein. So Freed talked the executives of the six record companies whose artists perform their songs in the movie to pass over the publishing rights for the songs to his own Snappner Music Inc. company. He succeeded with 15 of the 20 songs. Next, in return for allowing the record companies to display their disks in all theaters where the film plays, Freed got himself permission to use the songs on a DJ long-playing album. This was a brand-new idea! There was a growing market for 12" albums, so-called "packaged records", but only in the areas of classical music, Broadway shows, or jazz. There was no LP album from CHESS or any other rock-related company. 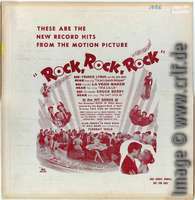 Something completely new by way of exploitation is being tried on ROCK, ROCK, ROCK; an L.P. record containing all twenty-one songs from the picture has been pressed. This record is going to every disc-jockey in the country with a letter asking him to set aside one evening in which to play the complete musical score from the picture. We further suggest that you contact your local disc-jockey and have him send out a press release stating that a premiere on disc will take place and have him mention the time and place. We don't know how many DJs followed this advice. 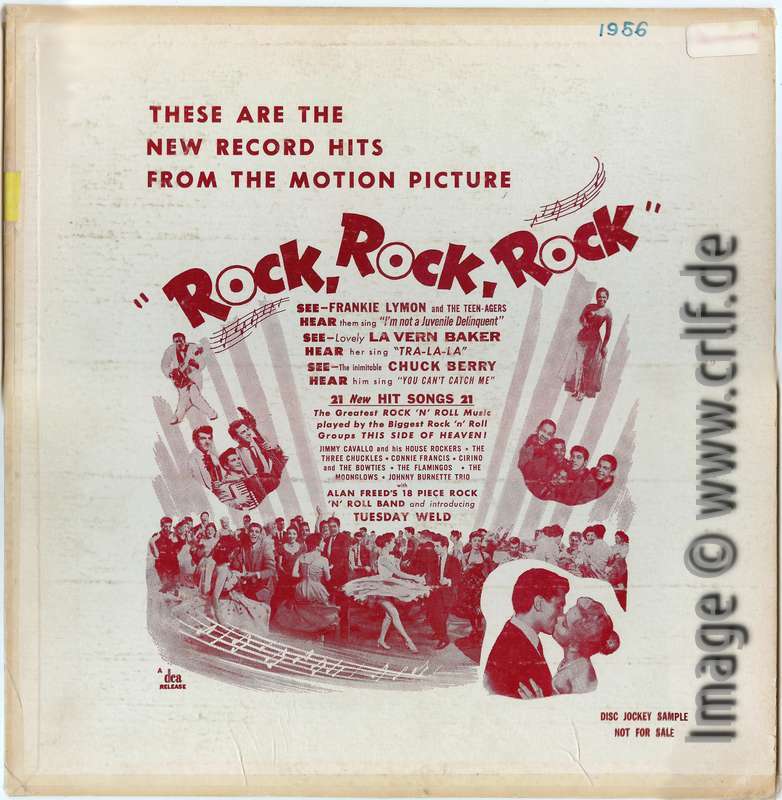 Alan Freed himself "world-premiered" this compilation on October 20th, 1956 on WINS. So it's safe to assume that the album was sent out by the end of October or early November 1956. 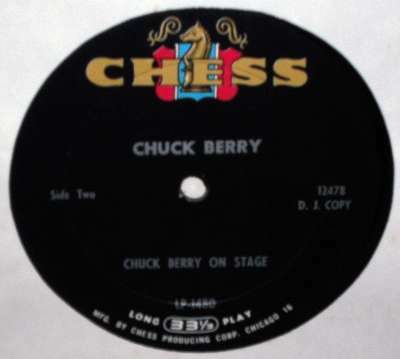 Even though more than 600 copies of this very first Chuck Berry album have been pressed and distributed, very few seem to have survived. Most recipients probably either threw it away or played it to death. The original album is extremely rare. 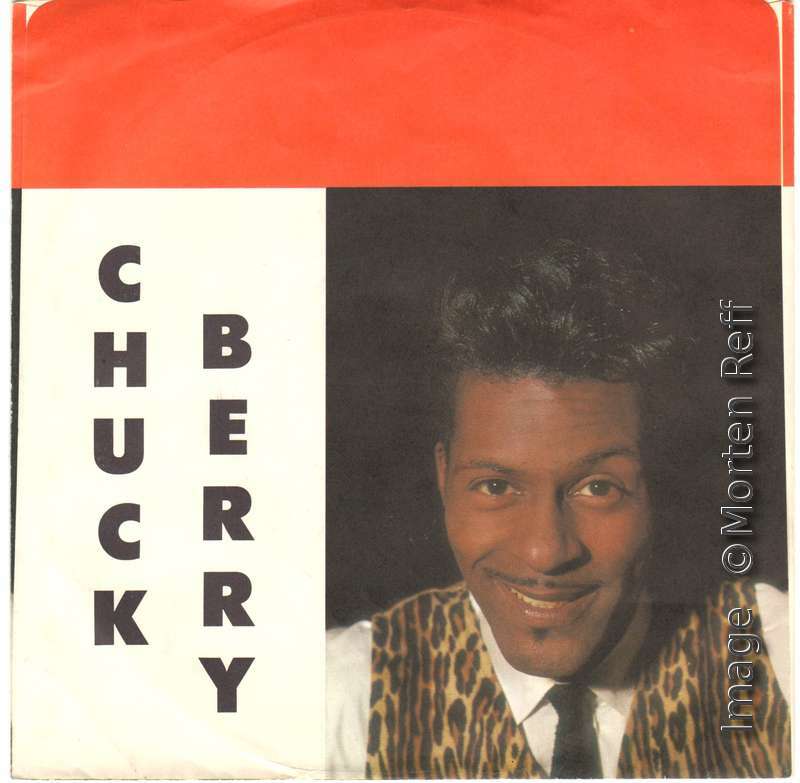 Even the most detailed discography of Berry, Morten Reff's "The Chuck Berry International Directory" fails to show an image as does all of the Internet. 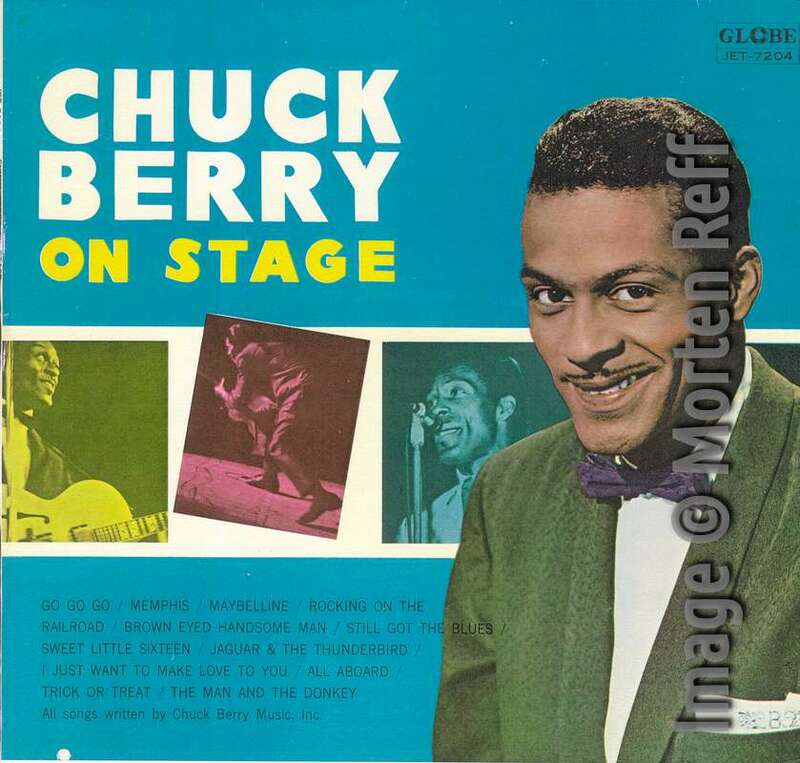 As you can see, there is an image of Berry as well as the line "SEE the inimitable Chuck Berry - HEAR him sing You Can't Catch Me". There is no back cover. That side is blank. There is no label nor any kind of catalog number. My best guess for a label name is the film company DCA. Morten Reff lists it under Roost, because the name of that record company is etched into the wax, as you can see on the high-resolution images. My guess is that Roost produced the album for DCA. The complete contents of this DJ sampler is as follows - with original label, composer, and publisher according to the film's music cue sheet. Some spellings differ from the album labels. Interestingly there are only 20 songs while the cover talks about 21. In addition to the name Snapper all over the track listing, you may also wonder about Glen Moore and Milton Subotsky. While Moore seems to be a composer indeed as his name is also credited in solo e.g. on the Flamingos "Would I be Crying", Subotsky was one of the two producers of this film and also wrote the screen play. Since he never again appeared as a songwriter, my guess is that there was another deal behind the scenes. Just like Freed receiving the publishing rights and license fees, Subotsky got his share from the songwriter fees. On a final note, there is a 1980s bootleg copy of this album on the Reel'n'Rock label (JN 5703) from Australia. 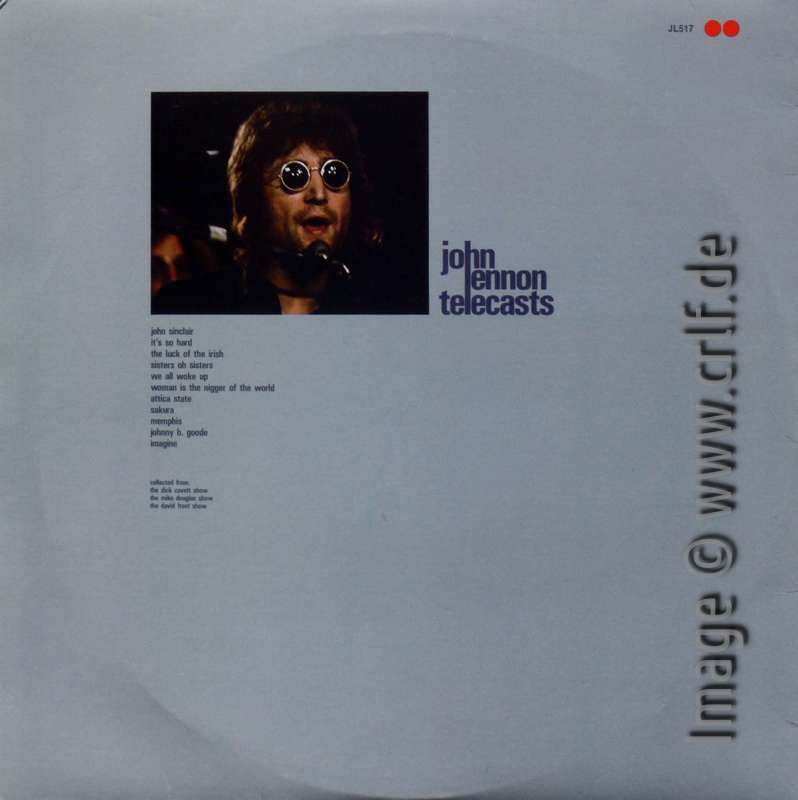 In contrast to the original album, the bootleg comes in a gatefold cover. 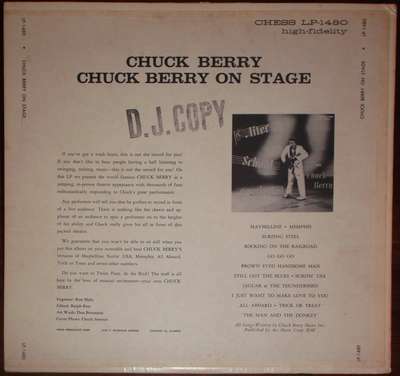 It has a back cover with liner notes and a track listing, both of which are missing on Chuck Berry's very first LP album. In the 1950s everything was simple: Singles had to run two minutes or 2:30 the max. Albums were just a collection of singles plus some tracks too bad for a single release. 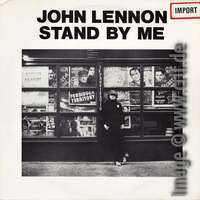 In the 1960s albums became an artistic concept on their own. 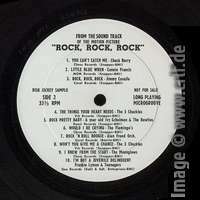 Singles were selected from the album tracks. And because album tracks often became longer and longer, record companies edited album tracks down to a running time reasonable for radio stations to play. That was something in the area of 3 to 4 minutes. By the way: According to The History of the 45 RPM Record, the longest 45 rpm track ever released was Bruce Springsteen's Incident on 57th Street (1987). 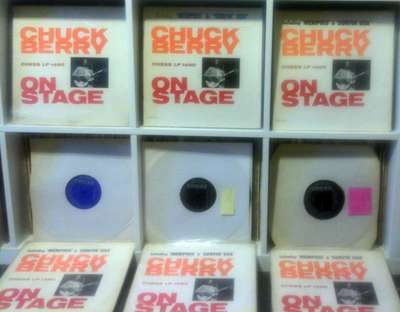 When collecting Chuck Berry records, you will find a couple of single edits. The most well-known is of course My Ding-A-Ling which was 11:52 on the original album and cut down to 4:16 for the famous #1 single. Ding-A-Ling has been re-issued on CD multiple times, so getting both the album version and the single edit is easy. However, some single edits are quite rare to find and you need indeed get yourself the original 45 rpm single to listen to the shortened version. Here's a table of tracks which have been edited to fit on a hit single. Not included are the many album tracks which have varying lengths on CDs or LPs due to different fades or space restrictions.